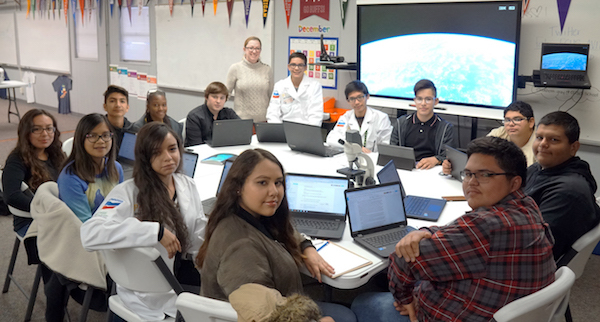 The Student Spaceflight Experiments Program is proud to report that there were a total of 2,498 proposals submitted from student teams across the 31 communities participating in Mission 12 to ISS. Of those, 1,101 proposals were forwarded for review by Step 1 Review Boards in each of the communities. Each Step 1 Review Board selected up to three finalist proposals, which were submitted to the National SSEP Step 2 Review Board. On November 30 and December 1, 2017, the Step 2 Review Board met at the Smithsonian National Air and Space Museum, reviewed all 98 finalist proposals, and selected one proposed experiment to fly for 28 communities, and 2 proposed experiments for 3 communities, for a total of 34 flight experiments. By December 14, 2017, the National Center for Earth and Space Science Education and the Arthur C. Clarke Institute for Space Education formally notified each community of their selected flight experiments. It is noteworthy that the 2,498 proposals received reflected a total of 12,150 grade 5-16 students fully engaged in experiment design. All 98 finalist experiment teams, along with descriptions of their proposed flight experiments, are provided below. 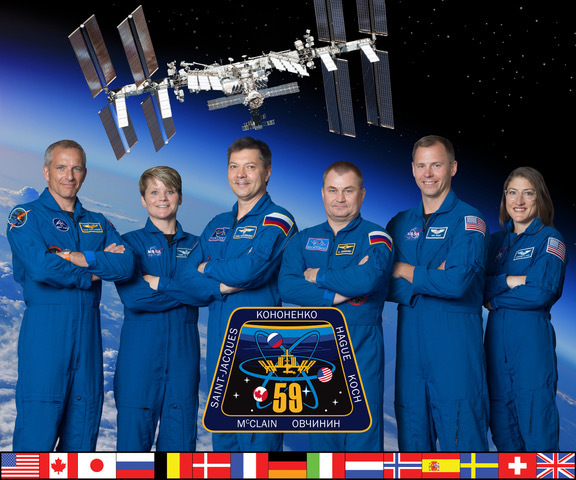 You are also invited to meet the SSEP Step 2 Review Board members for Mission 12 to ISS. Congratulations to the over 12,000 students and their teachers participating in Student Spaceflight Experiments Program Mission 12 to the International Space Station. 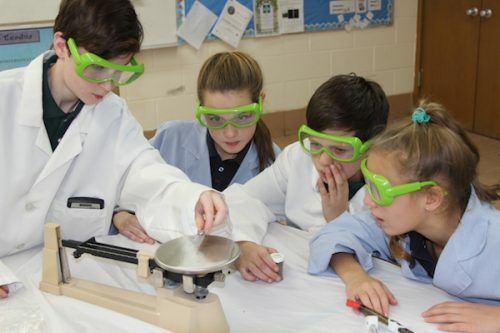 Laura D’Amaro Bittencourt (Grade 9, Dante Alighieri), Sofia Palma de Ávila Reis (Grade 9, Project Âncora) and Otto Gerbaka (Grade 9, Dante Alighieri) conducting their research on adding recycled green plastic to a cement mixture to reduce the effects of cosmic radiation in prolonged manned missions. We propose to answer the question: Is it possible to include powder from recycled plastic to the mixing process of cement production to make it more suitable to space application? Considering ISS will receive a plastic recycler machine, from the American company Made in Space, next year, our group is looking for new construction materials to make possible advanced manufacture in space. Our main concern here is to understand how the mix of three materials will be performed in space in comparison with the same process on Earth. The development of the material proposed here has the potential to mitigate some risks that cement could offer in the Microgravity. The “green plastic” is a sustainable polymer provided by the Brazilian company Braskem and current in use at the ISS with 3D printers of Made in Space. We propose to answer the question: How conserved blood behaves about coagulation and hemolysis in a microgravity environment? With this answer, we want to propose new approach to blood transfusion in space, considering our imminence in space colonization beyond the LEO. Currently, all the emergency the demands blood transfusion should be conduct with prompt return of the astronaut to Earth (with a Soyuz capsule at the ISS), however, future missions will be not close to Earth like the ISS, so new procedures should be contemplated. So, we are looking for methods to keep blood bags ready to be used in space. We propose to answer how the microgravity will effect on the actuation of the silver tungstate on the inhibition of bacteria development. To do this, we will prepare two sample tubes, which will be under the same procedures: tube 1 will stay on Earth and Tube 2 will fly to the ISS. We want to observe the development of a bacteria colony in the presence of silver tungstate within the microgravity and compare to the bacteria growing in the laboratory. For the experiment, we chose Bacillus subtilis, gram-positive bacteria found in the soil and in the human and ruminants digestive systems. B. subtilis is Biosafety level 1 species; that is not harmful for human being. These bacteria are very useful for the prevention and control of diseases caused by different pathogenesis species. The bacteria species was chosen by safety reasons, in a manner all the astronauts do not be jeopardized by the experiment. This study will be an initial vector for further studies on other bacteria. Parker Davie, Megan Poteryko and Abigail Sitler (Grade 11 from Nanaimo District Secondary School) conducting preliminary tests on muscle atrophy. Muscle atrophy in astronauts due to microgravity is a critical problem threatening long term space travel. Astronauts can lose up to 20 percent of their muscle mass on space flights with durations of just five to eleven days (Fitts, 2016). In order to counteract the muscle atrophy, the astronauts must exercise for over two hours each day; however, this may not be adequate to maintain muscle mass (Fitts, 2016). The goal of this experiment is to provide more insight on the supplement, L-carnitine and its effectiveness in treating muscle atrophy in a microgravity environment. L-carnitine has been shown to decrease muscle atrophy (Jang et al., 2016). The experiment is performed in a MixStix. In Volume 1 there are six planarians microinjected with a 0.01 mL saline solution to act as a placebo. In Volume 2 there are six brown planarians, Dugesia tigrina, that have been microinjected with a dose of 0.01 ml of 10 percent L-carnitine and India Ink. In Volume 3 there is 2 ml of 10% formalin to preserve the results. The planarians are weighed to determine changes in muscle mass. This preliminary experiment performed on the International Space Station will determine if L-carnitine has the same effectiveness on inhibiting muscle atrophy in microgravity as it does on Earth. If this experiment is successful, it can lead to further research of new ways to treat muscle atrophy in a microgravity environment. Astronauts subjected to extended periods of time in microgravity experience a number of problems returning to earth, including the accelerated growth of kidney stones. This experiment will bring us one step closer to solving this problem. The proposed experiment is to send 0.323 mg of uric acid dissolved in 4.6 mL of distilled water, and 1.034 mg of calcium phosphate dissolved in 4.6 mL of distilled water into the ISS, where both will be mixed to form observable crystals. Both of these reactants are key elements in the formation of kidney stones, and the size of the reactants were chosen based on the human body’s own quantities. When the reaction comes back to earth, the crystals will be observed and measured through their pH, fractal formation, and weight, and compared to the crystals that have been formed in an identical reaction performed on earth. By comparing the two, the effects of microgravity can be directly observed on the formation of these crystals. This will come about through the regulation of outside variables thought to play a part in the acceleration, so that microgravity can be isolated as the cause. This knowledge could change our understanding of this disease that plagues people returning from space, and enable us to advance forward in looking for possible cures or ways to slow the process. Such an advance in our understanding of the subject could contribute to the elimination of a health-related consequence that many people will face while spending long-term periods in microgravity. Successful pollination is an absolute requirement for sexual reproduction in higher plants (Wolters-Arts, et. al., 1998). The sexual reproduction of plants depends on the delivery of the sperm to the egg, which happens through a long extension of a pollen grain, called the pollen tube. We propose an experiment that will determine if there is a difference between Brassica rapa pollen tubes grown on the International Space Station, a microgravity environment, and on Earth. While much research has been done on the effects of microgravity on the germination of seeds, very little has been done on pollen tubes (Link, et. al., 2014; Paradiso, et. al., 2014). What we have found out about pollen tube growth in microgravity is that the vesicular trafficking is decreased, possibly because the pollen tube responds to the change in gravity by modifying the cell wall (Chebli, et. al., 2013). Based on this study, we hypothesize that the growth of B. rapa pollen tubes will have increased growth in microgravity. We chose the pollen grains of B. rapa because they have been used previously to study reproductive development in space flights, with no recorded problems (Kuang, et. al., 2000). If this experiment shows measurable differences, we can possibly use these results to further justify more research in this area. Different plants species could be compared to determining which types of plants would be best suited for reproduction in space and provide a sufficient food source for space explorers. Wolseley School team members Kiara Dayson, Betty Ngo, Sariah Dayson, Madeline Stewart; and Grosvenor School team members Keaton Fish, Quinn McMullin, Kale Peterson, Charlie Buehler and Merrik Williamson. The Wolseley team is experimenting to see if Yarrow can grow in microgravity, while Grosvenor is studying the growth of Lacinato in microgravity. Our group would like to see if lacinato kale grows better in microgravity. If it grows better in space then it could help on long-term space missions. The reason we choose lacinato kale is because it is one of the healthiest vegetables on the planet and has many vitamins such as vitamin A, K, E, C, B1, B2, B3, B6, Iron and Magnesium. It has more calcium than a container of milk, more vitamin C than an orange, and more iron than beef. It can be compacted into small spaces and it is very lightweight. If it can grow in an 8.4 ml test tube then astronauts can grow plenty more vegetables and will have food for a very long time. Lacinato kale is one of the fastest growing plants and germinates in 5-8 days. Lacinato kale doesn’t need much water to grow, but has so much nutrients. Lacinato kale has many health factors, including: it gives you a lower chance of getting cancer, it also keeps your skin healthy and lacinato kale is very helpful for your small intestine and your liver. Lacinato kale is great food to eat because it is easy to eat and is easy to clean and kale can be used for many things such as salads, sandwiches, wraps, pita, soup, and just by itself. When the lacinato kale returns to earth we will measure the growth of the stem, root and leaf. We will observe differences in color using a microscope. Can Yarrow Germinate in Microgravity? The question we are focusing on for our experiment is whether Yarrow seeds will germinate in microgravity. We decided to focus on Yarrow seeds because Yarrow is a traditional Manitoba plant that can be used for different types of medicine. We learned through our research that Indigenous people used Yarrow to cure headaches, toothaches, and stomach issues. We think that the Yarrow can help the astronauts on the space station because if they can grow Yarrow in space then they can grow their own medicine. Our Experiment will use two of the FME 3 Mini Labs- one for on the space station and one for our control experiment here at school. In our experiment, we are going to place ten seeds harvested from our school garden into Rockwool in Volume 2 of the mini lab. On the second day in space, we will have the astronauts unclip the clamp and add 3 ml of distilled water. We asked NASA staff about the temperature of the Space Station and were told that it was 22-25 degrees Celsius. We know that in temperatures such as this it takes Yarrow 14-28 days to germinate. We have planned to have the astronauts release the second clamp and add 3 ml of the fixative 10% Neutral Buffered Formalin to the growing seeds on day 31. This will preserve the seeds at exactly that time so that we can compare these seeds with the seeds from our control experiment to decide whether microgravity affected germination of the seeds. Our experiment is asking what impact microgravity has on the absorption rate of phosphorus by Lemna minor (duckweed) when it returns to Earth (after being exposed to microgravity). We will also measure the growth rate of Lemna minor in microgravity vs Earth. Our hypothesis is that duckweed will increase its growth rate. We believe this because we found research that scientists sent duckweed (kept in dark and with sugar water) to microgravity and they found the growth rate increased. Our hypothesis about the absorption rate is that the duckweed will absorb phosphorus faster. We think this because the duckweed had a positive growth rate in microgravity so it might do the same thing for the absorption rate. After our Fluid Mixing Enclosure (FME) has arrived back from the ISS, we will see how many fronds grew and calculate the growth rate. We will then put the duckweed in a container with a phosphorus solution to measure the absorption rate. We will perform the same procedures for the ground experiment. We watched a documentary, Save my Lake. It was about Lake Winnipeg and the Cyanobacteria problem. It showed us that marshlands can absorb phosphorus out of water. If the phosphorus level decreases, the level of the Cyanobacteria decreases. Duckweed can be used for many purposes: filter dirty water, fertilizer for crops, biofuel, animal feed, and food for humans. These are some of the issues that people will have when going to Mars. Our experiment has the potential to solve these problems. These students are removing their kudzu seeds from the seed pods and scarifying them. We know that kudzu is well known for being an invasive species, but we think that the pros outweigh the cons. We want to see if Pueraria lobata, kudzu, seeds will germinate and grow in space. We have been unable to find any evidence that kudzu seed germination has been tested in space. So, as possible space kudzu pioneers, we think that if kudzu will grow in space, it would be great for many space expeditions in the future. Kudzu has a variety of health benefits. The leaves, vine tips, flowers, and roots are edible. Also, kudzu is said to taste very similar to spinach. Kudzu is also a super food, which is rich with antioxidants and protein. Kudzu is also used for a lot of medical treatments, such as neck pain, chest pain, diarrhea, muscle pain, measles, fever, headache, gastrointestinal problems, and even alcoholism. It produces oxygen, so if there is a shortage of oxygen, it produces that as well. If kudzu seeds germinate in space, it could be an unlimited food source, compared to growing lettuce or other greens. This is due to the fact that kudzu grows up to one foot per day, when in the right environment. This could be very useful for long space expeditions to Mars and in the future to many other planets. Tardigrades (water bears) are water-dwelling, eight-legged, segmented micro-animals. They were first discovered by the German zoologist Johann August Ephraim Goeze in 1773 (Bordenstein, 2014). From withstanding space travel and some of the most unbearable temperatures, tardigrades are one of the most unique species in the world. We propose an experiment to determine the effect microgravity has on the dried carcasses of tardigrades. They can dry out completely in a form of suspended animation and then come back to active life much later when moistened. In their dry state, internal water is replaced with a sugar called trehalose. It has been shown that vaccines can be dried out in much the same way as tardigrades dry out. This would valuable since vaccines will spoil quickly when they are not at room temperature where refrigerated storage is often a problem. Also, it could solve the problem of transporting and storing vaccines on long spaceflights like to Mars. We are going to see if dried tardigrade carcasses will re-animate in microgravity. According to biologist and study co-author Thomas C. Boothby, these tardigrades could help fix fragile vaccines or medications in a stable state at room temperature so they could be stored and transported without expensive refrigeration. For our experiment, we have chosen to see how a red worm’s body grows back under the influence of microgravity. The worm we chose is called the Eisenia fetida, but throughout the proposal we will also use the term red worm. The average length of an adult red worm is between 3 and 4 inches. It takes the red worm around 21 days, or 3 weeks to regrow its tail. We thought this was a good choice of species because this worm can handle harsh environments, which will be great while it’s in microgravity. We would like to see how the regeneration process works in microgravity compared to how it functions on Earth. We chose this study because it was very interesting, and NASA has already done a couple of experiments with stem cell regeneration in space. To complete the experiment, we will be cutting the worm on the posterior end of the worm. We will be using a Type 3 Fluids Mixing Enclosure. In the first section, we will include small newspaper strips for the worm’s food, 3.2 ml of damp soil for the worm’s oxygen, and the worm. In the second section, we will have 1 ml of water. In the third section, we will have 2.8 ml of a fixative called formalin, which will before coming back to earth will pressure the worm. The astronaut will unclamp and shake the tube when necessary, which will allow our experiment to complete its cycle. Last minute decisions for the “Broccoli Study” team. The SSEP project proposed will be testing a broccoli plant experiment. The reason for this experiment is to test how the plant grows in space and how long it takes. Also we wish to determine if food can be grown in microgravity, to provide continuing supply of food for astronauts the farther they venture into space. Broccoli is a healthy choice of food because it contains many vitamins like Vitamin A, Vitamin C, Vitamin D, Vitamin B6, Vitamin B-and fiber. This experiment contains supplies like water, soil, fertilizer, broccoli seeds, and isopropyl 91% of alcohol. The exact steps to using this experiment in space are; Step 1: Put in the plug, Step 2: Add 2 ml of soil, Step 3: Add the 3 broccoli seeds, Step 4: Add an additional 2 ml of soil, Step 5: Insert the first clamp, Step 6: Add 2 ml of purified water, Step 7: Insert the last clamp, Step 8: Add 1 ml of isopropyl alcohol, Step 9: Insert the last plug. While the plant is growing in space, there will be another broccoli plant here on Earth will be growing and will be observed different time it takes to fully grow. If this experiment works out, it can change humanity’s thoughts of how we can grow plants in space. Not only helping astronauts but also humans here on Earth with growing crops. Without this experiment going to space, these questions are not put to rest. This project is being conducted to see the interaction of cotton with the hydroponic method in space. Cotton is a very important fiber in the clothing industry and is used for approximately fifty percent of the world’s clothing. If we are able to grow cotton in space, the clothing industry will be supported when we try to colonize other planets. Scientists believe liquid water is on the surface of Mars. The website stated, “Early in its history (particularly in periods older than 3.5 billion years ago), Mars had a thick enough atmosphere for water to run on its surface. This means that it is possible that we could grow plants on that planet.” There are minerals on Mars’s surface such as potassium and magnesium, which are also found in Earth’s soil. Being able to germinate cotton and make clothes in space will benefit mankind in the future. Furthermore, cotton seeds can be used for oil, and ways are being found to make cotton seeds edible by genetically modifying them to remove the toxic gossypol. The cotton seed oil is extracted from varieties of seeds and is used for frying foods and flavor enhancement. This could also revolutionize food production. Texas A&M University is at the forefront of this technology. The SSEP project is focused on determining if cotton will germinate in microgravity. The hypothesis for the project is that the cotton will germinate and grow in microgravity conditions. Egyptian, Pima, and Sea Island are the longest known cotton fibers that are grown. Their average fiber length can reach up to 1.7 inches long. (Beaufort.com 2017). Egyptian, Pima, and Sea Island make up a small amount of the total cotton germinated. They are grown from a special seed that germinate in areas limited to a specific temperature range. For optimum cotton germination the soil temperature, where the seed will be planted (0.5 to 1.5 inches deep), and the surrounding air temperature should be at least 65°F. Cotton seed germination can be sporadic at soil temperatures less than 58°F. In the SSEP experiment, the investigation will examine whether or not microgravity will influence cotton seed germination. This experiment will allow NASA will learn how to grow cotton seed in microgravity, like that on Mars. As a result, cotton products may be harvested and used for multiple purposes. Soybeans (Glycine max) provide a great amount benefits for consumption. It is low in fat, excellent source of fiber, and rich in calcium. Aside from nutritional benefits, soybeans provide health benefits. They boost the metabolic activity in the body, lower cholesterol levels, improve digestive and bone health, and improves blood circulation and heart health. By growing soybeans on the International Space Station (ISS), it will promote the growth of other foods onboard. A soybean plant being grown in the microgravity environment will not only provide a food source, but will be more cost efficient in providing food for astronauts. Instead of sending food from Earth to the ISS, astronauts will be able to grow their own food on the International Space Station. It will also allow the recycling of wastes, aide in the removal of CO2, add the ability to purify water, and produce O2. This experiment overall will provide a better understanding of what role gravity plays on soybean growth. The seed germination process will begin once the seeds have reached the International Space Station. At the same time, we will start our own experiment in our lab on Earth under identical conditions. Just before the microgravity seeds return to Earth, we will stop the sprouts from growing with a fixing agent. When the two sets of germinated seeds are compared back in our lab, we will look at sprout and root length, root morphology, note differences in ramifications, node lengths, and masses of germinated seeds. We will use a microscope to observe changes in the cell structure of the soybean roots; this will provide us with the data needed to know the effects that microgravity has on a microscopic scale. Knowing how microgravity affects each aspect of the germination process will help determination the germination rate of soybeans in microgravity. Scientists and engineers can also use this knowledge to design effective microgravity gardens. What is the Effect of Microgravity on Potassium Sulfate Crystal Formation? Our research area is inorganic crystal growth. We chose this area because it is important for technology and water purification. It is beneficial to humans because we use crystals for a lot of things that we need or may need in our lives. One of the things in the world that might become a problem is technology increasing, with that comes a lot of crystals because technology uses a lot of crystals and we would need more crystals. With this experiment we will learn how potassium aluminum sulfate reacts to microgravity. This is important because potassium aluminum sulfate can be used for water purification. It will benefit because if the crystal grows better, then whatever we use it for should come out even better. Research has already been done on crystal growth in microgravity. From previous experiments, crystals in microgravity are known to grow 34 times larger than normal. To make potassium aluminum sulfate crystal, you first need to mixt he potassium aluminum sulfate powder with hot water. During this time period you will mix as much of potassium aluminum sulfate powder into 1 cup of hot water which will dissolve (during this time you can add coloring into the solution). After the solution is made, pour it into a clean container, thus allowing it to grow overnight. After use a fork or spoon like tool to scrape crystals from the bottom of the container. Will Microgravity Affect the Rate of Which E.coli Decomposes in the Presence of Penicillin? Throughout human history, bacteria have been present in every civilization. Modern medicine took its largest leap with the discovery of the antibiotic; penicillin. In 2006, Cheryl Nickerson sent a culture of salmonella bacteria for a ride on the space shuttle Atlantis. Cheryl Nickerson speculated that the surface of the bacterial cell had reduced in space and the molecule-cell interaction also showed a reduction. E.coli is usually found in food so it’s typically known as food poisoning and can be deadly to those with a compromised immune system. Now that space travel is becoming more common, we must take more precaution to make sure that our astronauts are safe from even the smallest kinds of killer. The microgravity of space provides a unique test bed for developing new techniques, products, and processes that can benefit not only astronauts but people on earth. By growing two samples of E. coli, one in space and one under the influence of gravity, and then combining both with an antibiotic such as penicillin, we are able to measure the antibacterial growth of both cultures. For this project, we plan to test the rate of which E.coli decomposes in the presence of penicillin within a microgravity environment. Most antibiotics take 24 hours to kill the bacteria or at least start to kill bacteria. Would this time period be different in microgravity? 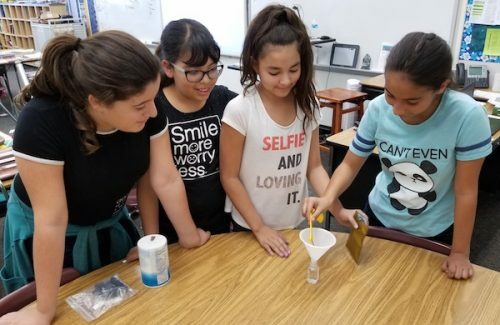 Young scientists at Mark Twain Elementary in Riverside, California conduct research project about life inside and outside of Earth’s gravity. Our experiment will compare the hatching of brine shrimp eggs in a microgravity environment to the hatching of brine shrimp on Earth. Our experiment will consist of astronauts on the International Space Station mixing brine shrimp eggs with water with a pH of 8 (similar to sea water). The brine shrimp will hatch during this time. After two days a solution of paraformaldehyde will be introduced to the brine shrimp. This should stop the experiment and preserve the brine shrimp. Once the experiment is returned we will measure the number of brine shrimp that hatched in 0.1 mL of solution. Several 0.1 mL samples will be taken and the mean will be used. The experiment will be repeated in our classroom with the same parameters. People usually need to have a remedy to an illness that they have. Basil is not only an herb to add flavor to food, but is also a natural remedy, too. We propose an experiment to study if basil seeds can grow in the same amount of time, different amount of time, or change the cell growth in the basil. Thanks to the enzyme, essential oils, and antimicrobial agents in the basil plant, it can help astronauts with fighting diseases in the immune system, like migraines, cancer, and cardiovascular diseases. Basil can also help with minor illnesses like colds and flus. Our idea is if basil can grow in space without any miscalculations it can help astronauts fight diseases listed above. This means astronauts do not have to use many chemicals that could potentially be harmful to their bodies, but instead use a healthier method. We came up with this idea when we brainstormed plants that could help out the human body with diseases in the immune system, and while researching we found that basil, since it was the best druther. Basil is ductile, so it would be easier to grow in a compact environment like space. Basil has many uses to everyone, so surely, astronauts could use it. We want to see if plant roots will grow in a different direction while aboard the ISS because of the small amount of gravity in space pulling on the roots so it won’t pull the root direction downward. We want to see if the low amount of gravity and oxygen will affect the way roots on a plant grow. We expect the roots of a plant to grow a different way than the roots grow on earth. We decided to do this because it was interesting how the amount of gravity can affect root growth direction. The roots might grow slower because of the weaker amount of gravity. 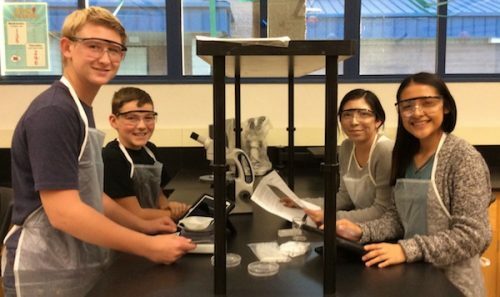 Fairmont Elementary 7th graders Sean Viau and Austin Griesner are working along side their Sanger High School collaborators, Elisa Rocha and Jackie Ramirez, refining concentrations and volumes for their flight experiment, how microgravity affects the developmental stages of brine shrimp. In this experiment, we will be investigating how microgravity affects the developmental stages of brine shrimp. This can be useful to the world because aquaponics is a topic being explored in space currently as a means of a possible food source. Learning to produce food sources will allow humans to survive for extended periods of time in space or even another planet like Mars. Aquatic animals would be a good source of food. The developmental stage will be determined using the scheme devised by Weisz, “these stages are numbered 0–19, depending on when the last thoracic (0–13) or abdominal (14–19) segment rudiment first appears. Stage 19 is taken as the final stage and covers all of the remaining life cycle of the sexually mature adult. Total body length will be measured using an ocular micrometer. Body length will be taken as the distance from the front of the median eye to the posterior margin of the telson (Wachter, 1992). For our experiment, we will be evaluating if, when the pseudoephedrine is put into microgravity, the proteins in the capsule break down. When the capsule breaks down the medicine is less effective. Our experiment will determine if wrapping the pills in 0.25g paraffin wax can slow down the effects micro gravitational pull has on the decomposition of the capsule. Understanding the effects of microgravity on pseudoephedrine will be highly beneficial to the international space station; if there is a way to make sure the capsule and the medicine stay completely intact in microgravity and not break down, then the medicine will have the same effect on patients in microgravity as it does on earth. Throughout the course of this experiment, I will be testing whether or not microgravity affects the ability of tardigrades to transition out of cryptobiosis. Tardigrades are eight-legged, water-dwelling invertebrates that can be found in the most moss-producing environments. Tardigrades are also called water bears or moss piglets. Cryptobiosis is the state in which almost all moisture has left the body and they are practically undetectable. It is known to happen in certain plant and animal groups that are adapted to surviving periods of extreme conditions. This project is significant because tardigrades produce a sugar-like substance called trehalose. Scientists have found that this substance is what makes their cryptobiosis possible, preserving all of their cells for long periods of time. Scientists have found practical uses for the trehalose, including preserving blood so that when it is needed, cells can be reactivated with water. Another practical use of trehalose is that it has been used to preserve food and medicine for prolonged periods of time. This experiment will be tested in the type 3 FME mini-lab so that I can test whether or not microgravity affects the ability of tardigrades to transition out of cryptobiosis. Dormant tardigrades in cryptobiosis, will be made active by adding water, then transitioned into cryptobiosis by adding saline, all while in space. Determining the effects of microgravity on tardigrade lifespan could potentially lead to the development of scientific procedures that could preserve medicine, food, and even blood. Student scientists at Discovery Charter School in San Jose, California prepare a mini-lab for space flight. This experiment will examine the effect of microgravity on the germination of a spider plant seed, and will determine if the spider plant can successfully grow in space. This is important because scientists have found that indoor air pollutants are ranked among the top five environmental risks to public health. In addition, living and working in places rife with air contaminants can cause headaches, dizziness, nausea, and can eventually lead to cancer. These chemicals are even more prominent in space and on the ISS, and spider plants would reduce up to 90% of formaldehyde, carbon monoxide, O-xylene, and P-xylene, which would dramatically purify the air. Our findings would greatly benefit the health of future astronauts; if this test is successful, we could plant spider plants in microgravity, and the air quality in space would get significantly better. To test our idea, we will send eight spider plant seeds into space along with a solution of water and a nutrient, as well as a growth inhibitor, separated by two clamps. On the day of the arrival on the ISS, the astronaut will release Clamp A, combining the spider plant seeds and water/nutrient solution; starting its process of germination. Two days before undocking, the astronaut will release Clamp B, mixing in our growth inhibitor, which would terminate the process. At the same time, an identical test would be done on Earth so that we can compare the results to the test we perform in microgravity. Lactobacillus casei is a strain of probiotics that is found naturally in the human gut and in dairy products such as yogurt. Our question is what effects an environment of microgravity will have on L. casei. Yogurt is a healthy and nutrient-rich dairy product. In the future, if humans colonize in space, it could provide a beneficial and wholesome source of energy. Yogurt provides almost every nutrient that the human body needs, such as protein, calcium, magnesium, potassium, Vitamin B-2, and Vitamin B-12. Also, the probiotics, vitamins, and minerals in yogurt may help to strengthen your immune system. As stated before, yogurt is a source of calcium, and it can help with the bone deterioration that happens during long-term weightlessness. Bone loss is one major nutrition-related issue for astronauts on long-term missions, as they have been known to lose bone density at an average rate of 1 to 1.5 percent a month. Moving forward, this experiment could help astronauts improve their health conditions in space and provide a good food source for future space exploration. Someday, before the sun swallows the earth, long distance space travel will be necessary. But, will space born babies be able to sense gravity once they arrive on a different planet? To take a glimpse into what might happen in this scenario, we are proposing an experiment to hatch brine shrimp eggs in space. Artemia Cysts are the scientific term for brine shrimp eggs. Since most of the brine shrimp’s body is transparent, it will be easy to observe and study them. We would like to see if they develop a sense of gravity even though they were born in microgravity, and what their behavior and movements will be upon returning to earth. We will also study their body organs as well. Using a Type 3 FME, we will put an aquarium salt and water solution in one volume, dehydrated brine shrimp eggs in the next volume, and insert spirulina powder and Liquifry Marine for brine shrimp food in the other volume. We hypothesize if they hatch in space, they will have severe issues when swimming on earth, because the brine shrimp wouldn’t have been exposed to gravity before. The goal of our experiment is to see the effects of long-term space travel on humans and other animals. In microgravity, the brine shrimp eggs will be turned on immediately after arrival on the space station. Since the eggs are dehydrated, the water will rehydrate them, allowing them to hatch. We have researched that they will hatch in 18-36 hours. 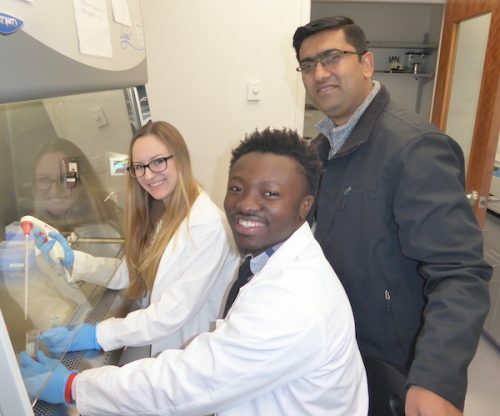 Biology undergraduate students Emily Juliano and Feissal Djoule working on their project with mentor Dr. Isaac Macwan from the Department of Biomedical Engineering at UB. A cell contains numerous proteins on its surface and in the cytoplasm that carry out a variety of functions. Maleimide – functionalized Graphene quantum dots (m-GQDs) have the ability to attach or “tag” both cell surface and intracellular proteins in the gravitational setting. Such quantum dots have photoluminescent properties, which can be utilized for tagging the cysteine residue on the proteins thereby using them towards bio-imaging applications. This experiment proposes whether m-GQDs will have a stable binding onto the cellular surface and intracellular proteins found in Chinese Hamster Ovary (CHO) mammalian cells under the influence of microgravity. If this is found to be successful, it can provide useful information for studying the effects of microgravity on a physiological system based on the way proteins behave compared to a gravitational setting. The basic principle of this procedure can be further utilized to study many other cellular processes under the influence of microgravity by simply tracking these “tagged” cellular proteins under a fluorescence microscope. There will be fifteen microgreen seeds in a container with Gardener’s Gold potting soil (2016) and will be kept consistently moist with tap water, which is our control experiment. Over time, the seeds will grow into tiny plants, which are variations of lettuce. Microgreens are so versatile; they could grow in almost anything as long as there is soil and moisture. During the actual experiment, there will be five microgreen seeds inside the FME tube with the soil and tap water. Keeping the factors that affect its growth at the same rate on Earth and the ISS, using no light, we would like to see if the growth process is different in microgravity than on gravity. The virulence of viruses is a topic of interest for the wellbeing of human health during space travel. Little research has been conducted on differing virulence between bacteriophages in space and on earth. However, prior research suggests evidence that a difference may exist. Hfq is an RNA binding global regulator protein present in E. coli which has been shown to be required for Coliphage qB to infect E. coli. In a squid-vibrio experiment conducted under simulated microgravity, the hfq protein production was seen to be down-regulated in Vibrio fischeri (Grant, 2014). Our experiment aims to imitate results found by Grant under a real microgravity situation in Escherichia coli, given that Hfq is highly conserved in bacteria. The experiment will compare the virulence of Coliphage qB on E. coli in space to the virulence on land. The resulting difference in rates of Coliphage qB infection of E. coli may hint at unknown molecular mechanisms that bacteria and/or viruses employ under the effects of microgravity, and may provide evidence to suggest that hfq is also down-regulated in E. coli in microgravity. The implications of the results found by this experiment will be a step into determining the virulence of viruses and other infectious organisms during spaceflight and may lead to effective preventative measures to safeguard the health of humans in space. 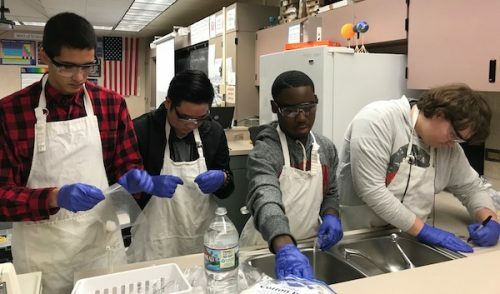 The Stamford High School Dream Team working on their experiment. Our mission seeks to analyze the effect of microgravity that occurs in the reproduction of the fungus Sordida Fimicola. In a reproductive cycle, this fungus undergoes meiosis and mitosis. Meiosis is the sexual process in which cells reproduce, and crossing over is vital to achieve greater genetic variation. Crossing over is a process that occurs in meiosis that involves the switching of genes between two homologous chromosomes. Without this gene shuffling, there will be fewer possible ways in which a gene can be made, decreasing genetic variety. With a wider variety of offspring, the species is more likely to adapt to environmental changes. Our experiment analyzes the effect that gravity has on crossing over. To measure crossing over, our experiment breeds together two colors: a black (wild type) strain and a tan (mutant) strain. When Sordaria Fimicola breeds, it creates ascii with eight ascospores each, and the arrangement of the colored ascospores can indicate whether or not crossing over has occurred. Another aspect that is visible is whether or not a mutation has occurred. There are expected to be eight ascospores, and four of each color, in those created as a result of crossing over. If one of these conditions isn’t met, it becomes evident that a mutation has occurred. These two individual factors show scientists how prepared organisms are for the vast emptiness of space, and arm them with the knowledge to tackle these problems should they appear. Our exploration of space has encountered yet another unanticipated hurdle: vision impairment. In 2013, 50% of long-duration ISS mission astronauts reported a subjective degradation in vision (NASA, 2012). Post flight tests also show that 80% of astronauts suffer from visual impairment intracranial pressure syndrome (VIIP) (Washington Post, 2016). According to NASA, microgravity conditions cause increased flow of cerebrospinal fluid into the cranium and thus increased intracranial pressure (ICP). This causes papilledema, or optic disc swelling triggered by ICP, which effectively impairs vision. A common treatment for this condition is acetazolamide (Diamox) (Medscape, 2016): an enzyme inhibitor that acts on carbonic anhydrase, which catalyzes the dissociation of carbonic acid into bicarbonate and protons (H2CO3H+ + HCO3-) (Center for BioMolecular Modeling). Our experiment measures bicarbonate ion concentration in human blood exposed to acetazolamide. A pH meter will be used to measure the alkalinity/acidity of the solution, which is indicative of the bicarbonate ion concentration (HCO3-). Since the measured pH is a function of the proton (H+) concentration in the sample, which is equal to the bicarbonate ion concentration when chemical equilibrium is established, we can effectively calculate the bicarbonate ion concentration with the measured pH. Bicarbonate is one of the components of CSF that transports other components from blood in the capillaries to the ventricles; therefore inhibiting its production results in reduced ICP. The aim of this experiment is to open discussion regarding whether acetazolamide is a viable treatment to prevent vision impairment for astronauts on long-term space missions. Our mission seeks to determine the viability of yeast cultivation in microgravity. The cost of transporting resources necessary for human life in space inhibits space travel terribly. Water, for example, costs upwards of $9,000 per pound to transport to the ISS, and transporting food is similarly expensive. By cultivating yeast in space, this cost can be subverted. Creating a source of ingredients on the ISS, rather than constantly shipping the finished food products decreases the cost of missions involving human beings. NASA has in the past analyzed the behavior of yeast in space as a proxy for humans, or as a simple biological sample. Our experiment seeks instead to analyze yeast as a resource in its own right. Yeast secretes an enzyme called zymase, which aids in fermentation. This fermentation converts sugar into alcohol. The alcohol that is created can be used to make bread rise. Baking bread is already possible in microgravity, meaning the yeast and its alcoholic byproduct can be put to use. Furthermore, yeast can be used to produce fuel and commercial products, such as alcoholic beverages, which can benefit from the commercial advantage of the extraterrestrial origin. 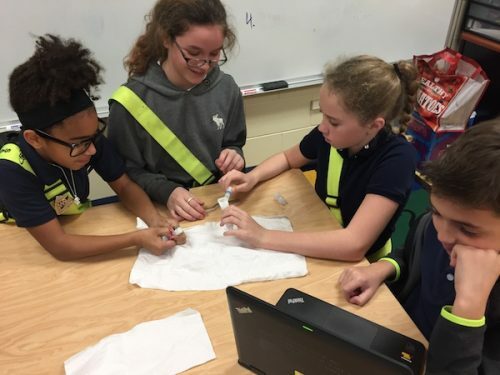 Students at Limona Elementary practice their experimental protocols for their experiment to test the effect of microgravity on the germination of wheat seeds. From left to right they are: Lyric Judge, Lindsay Wills, Soleil Gates, and Ben Rieger (not pictured are: Josue Bueno, Tristan Gant, Meghana Thomas, and Pranav Verma). Our scientists propose germinating wheat in microgravity and Earth gravity to determine if microgravity affects the growth of wheat. Astronauts in space could quickly germinate wheat – according to our research, two days at the most. Wheat is a very common food that people have been eating for thousands of years. Since most astronauts have been eating wheat all their lives it might be a comforting food source for celestial travelers. Wheat is very nutritious and can even help prevent type two diabetes and heart attacks. Wheat can also help with weight management, since exercise opportunities for astronauts may be limited this might be important. Astronauts on long space journeys could use wheat to stay healthy and nourished. This is why we propose wheat germination for our experiment. We are going to place five wheat seeds on a piece of felt in the center chamber of a type III FME. On one end of the FME will have a small volume of water that will begin the germination process when the clamp is opened. On the other end of the FME we will have a fixative substance (Formalin) that will stop the germination when that clamp is opened. We can compare the germination rate of our seeds on Earth to the seeds that went to space. Many types of foods are made from wheat. Wheat could add variety to the diet of astronauts. If wheat germinates well in microgravity then it may help support space travelers on their way to Mars. Our question is: does microgravity affect the frequency rate of the germination of dwarf gray sugar pea seeds? We have decided to use dwarf gray sugar peas because from our research we have learned that dwarf gray sugar peas grow in an environment with a similar temperature as the ISS. This experiment would allow scientists to learn more about the effect of microgravity on the germination of dwarf gray sugar peas. Dwarf gray sugar peas make a protein and fiber-rich form of food that is packed with eight vitamins and seven minerals. They are an excellent source of Vitamin K, which aids the absorption of Calcium in bones. They are also a good source of folic acid and Vitamin B6. This could be a beneficial supplement to an astronaut’s diet. In our experiment, we placed the seeds on felt, sprayed them with tap water, and observed how much they germinate by keeping a log on the germination. The results were excellent, with germination and growth occurring within four days. We learned from Dr. Gioia Massa’s research, the Principal Investigator of Veggie 01 that felt makes the best medium for seed germination. In our experiment in zero gravity conditions, we will use a type 3 FME. Volume 1 and 3 will each contain dwarf gray sugar pea seeds wrapped loosely in felt. Volume 2 will contain 5ml of tap water from our school. Our question is how potato tubers will sprout and grow in microgravity compared to Earth’s gravity. We know that a typical Yukon gold potato has 100 calories, 4 grams of protein, 45 percent of a human’s daily Vitamin C, 3 grams of fiber, high in carbohydrates, and are fat free tubers. They also boost energy according to McKinley Heath Center, 45 to 65 percent of the calories in your diet should come from carbohydrates because they are your body’s preferred source of energy. Yukon gold potatoes have those calories from carbohydrates, so all together, they would make an excellent choice for space crop. As part of our test, we will observe how the sprouts (new stems) develop. On Earth, the newly sprouted stems grow upward against gravity, but how will they grow in weightlessness? Will there be side stems or stolons that grow in space? A potato gives us a chance to observe these different phases or growth. 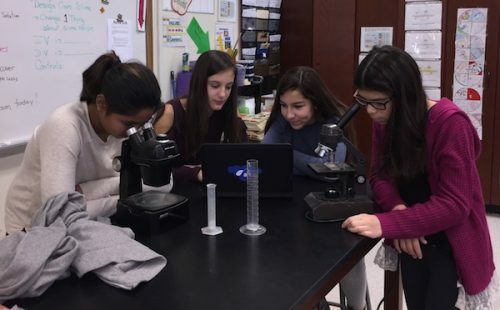 Alexis Mulholland, Taylor Dreger, Shivani Chaube, Ashton Persaud, Danielle Hoppas, Ashley Medina, and Kelis Stanisclaus conduct research in preparation for their upcoming launch, under the advisement of their teacher, Mr. Kurt Schultze. If we send Sea Monkeys to space, then the hybrid brine shrimp will change the way they live in order to survive in spaces conditions. Our group has collaborated and would like so send the hybrid breed of brine shrimp also known as the Sea Monkeys into space to see if growing them in space will alter how they act and grow. We choose to send Sea Monkeys on a journey to space to see if a hybrid would act different in space. Sending Sea Monkeys into space might cause them to act enervated, and even less responsive to light which sea monkeys are attracted to luminosity since they are naturally drawn to light sources. Sea Monkeys are ephemeral brine shrimp with lifespans of a month or two in a great sustained society. Water kefir grains (also known as Japanese water crystals, or tibicos) are constituted by a symbiotic culture of bacteria and yeast that thrive in sugar water and multiply. A by-product of this is a consumable liquid which may be used as a salubrious beverage. Authentic water kefir grains are rare and can only be passed down by another. Our analysis ventures to grow Japanese water crystals in microgravity in comparison to a parallel sample cultivated on Earth. Since this investigation has yet to be conducted in microgravity, our experiment would be the most impeccable to date. The motive for our experiment is to document the effects that microgravity has on the tibicos. Tibicos are “clusters of bacteria and yeast living in a symbiotic relationship and held together by a polysaccharide (dextran) produced by Lactobacillus higarii.” (The Origin of Water Kefir). Our experiment will consist of two chambers, one of which will contain the grains while the other will contain the sugar water. Within the week that the project is initiated, the clamp keeping the sugar water from the grains will be removed and the mixture will combine with the tibicos and they will ferment the water, which will then grow and we will document the new information. Once we record the result of our investigation, we will have a solution to illness, if humanity were to colonize parts of space and if they were to run out of cures, as well as improve overall health. In this experiment we will test how white blood cells reproduce in microgravity. We have gathered these facts on white blood cells. White blood cells also known as leukocytes are cells inside the human body that help fight infections. A normal person’s blood cell count is around 4300-10800. Diseased blood can have about 7000 to 25000 white blood cells per drop. This information was found on “Bone Marrow and the Immune System About Kids Health”. As bone marrow is cut off, the sample is bound to die in a number of days. To keep preserved, the sample must be frozen. While the bone marrow is frozen, it is still alive, it does not produce white blood cells. This experiment would benefit our research for cancer. 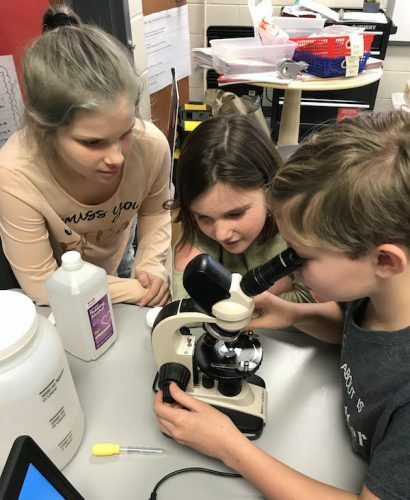 Audrey Waters, Anna Holley and Ellla Cobb (5th Grade students at Gum Springs Elementary) conducting their research on Artemia salina. Our research team would like to conduct an experiment to see if Artemia salina, fairy shrimp, will hatch in microgravity. Our question to be addressed is whether, Artemia will hatch in microgravity to serve as protein for the astronauts. If so, this could provide a working protein source for the astronauts. Protein provides the necessary amino acids for muscle growth and repair. Fifty-two to fifty-six percent of an Artemia body is protein. Fully grown Artemia are about five centimeters in length. Juveniles are about two centimeters in length. You can eat a small amount to receive a large amount of protein. Artemia are great for helping prevent muscle degeneration because of the amount of protein they provide. Astronauts experience muscle loss in microgravity. If Artemia salina (fairy shrimp) are able to hatch in space, this could help provide additional protein to astronauts. Plants are important to life on Earth. Plants provide us with food, fiber, shelter, medicine, and fuel. Plants also maintain the atmosphere. They produce oxygen and absorb carbon dioxide during photosynthesis. Oxygen is essential for cellular respiration for all aerobic organisms. In this experiment, we will determine if strawberries can germinate in a microgravity experiment. If so, then there is a possibility they can grow strawberries in space. Strawberries are a healthy food to eat. Since astronauts are on the International Space Station a long time, they probably get tired of eating space food, like freeze-dried meals. Strawberries would be a nice supplement to their diets. Plants have also been used for therapeutic purposes for years. Future astronauts may be traveling through space to the Moon, Mars and beyond. They will be millions of miles away from everything they know and love. By having plants on board the spacecraft, it could reduce feelings of isolation. After the seeds have been in microgravity, our team will continue to grow the strawberries here on Earth. Once they are fully grown, we will compare the berries to ones that were germinated here on Earth. We will compare the size of the berries and the taste (sweetness). We realize there are challenges with growing plants in space such as lack of naturally occurring light and also limited space. Will Tea Tree Oil Kill E. coli in Microgravity? We are investigating if tea tree oil will kill bacteria or disinfect bacteria in cuts, scrapes, and burns in microgravity. We are specifically looking at Escherichia coli (abbreviated E.coli), a large and diverse group of bacteria. Most strains of E.coli are harmless; however, others can make you sick. Oils from the tea tree, also known as Melaleuca, are well known for its powerful antiseptic properties and ability to treat wounds. It has been mentioned in various medical studies as being able to kill many strains of bacteria, viruses and fungi. In this experiment, the mixing tube will have E.coli on both ends with the tea tree oil in the middle. When the astronauts remove one clamp, there will be one treated sample and one untreated sample which will serve as the control sample. If the tea tree oil kills the E.coli, our hypothesis is confirmed. This will lead us to determining if tea tree oil is a good natural resource to killing E.coli and other bacteria in microgravity. This will be good information to know in case the astronauts get an infection in space. They will be able to use the tea tree oil to heal the infection. Alexa Wong is verifying the assembly of the FME while Daralyn Wen prepares solutions and Allison Li examines the nematodes. Not pictured is team member Veronica Will. This experiment investigates how microgravity affects reproduction of a nematode worm,Caenorhabditis elegans. This organism is approximately 1 mm in length, has a lifespan of two weeks, and reproduces in about five days. In microgravity, it has been shown to have reactions similar to humans. The study will compare and contrast how the worms produced in microgravity differ from those produced on Earth, including visual differences in development, as well as differences in rate of reproduction. Fertile C. elegans will be deactivated before being sent to the International Space Station. Once in space, they will be activated. They will be given nine days to reproduce, approximately two generations, and then will be deactivated, with Formalin solution, and returned to Earth. Once back to Earth, data will be processed and evaluated. While results of the study cannot be directly tied to human reproduction in microgravity, studying other organisms and how the development of their offspring differs in microgravity than on Earth can help to better understand how microgravity affects human reproduction. As plans for humans to embark on long journeys in space or colonize other planets have become more realistic, understanding reproduction and growth in microgravity is a major concern that needs to be addressed. This experiment’s purpose is to test gravity’s effect on the regenerative abilities of stem cells through observation of the planarian Dugesia japonica (flatworm), which are known for their regenerative abilities using stem cells. This would help us grasp a better understanding of regenerative science in space. About twenty percent of a planarian’s cells are stem cells, making them suitable for stem cell and limb regeneration experiments. Stem cells have the potential to develop into different cells for various use around the body, and can divide to reproduce. If colonization of other planets is to become a reality, being able to synthesize organs and other body structures would be extremely beneficial. Seeing if flatworm regeneration is possible–or maybe even more efficient–under microgravity would also help to advance regenerative medicine on Earth. Understanding eukaryotic growth in microgravity is necessary to further human space exploration in the coming decades. The proposed experiment concerns how the nitrogen concentration gradient is affected in microgravity and the impact of those effects. Nitrogen plays a role in the development of proteins, carbohydrates, and lipids, therefore impacting the nutrient quality of space crops. Examining how effectively the processes of endocytosis and pinocytosis occur in a microgravity environment is essential. Some change is likely, given that previous studies show fluids act differently in space. The microalgae Scenedesmus obliquus was chosen because it is an ideal space crop, as it could provide a sustainable alternative as a source of food and power, act as a waste water purifier, and more. S. obliquus has the advantage of adapting from an autotrophic to a heterotrophic state, thus decreasing the cost and resources required for its cultivation. Furthermore, nitrogen starvation has been shown to affect S. obliquus composition: “the ratio between starch and fatty acid synthesis correlated strongly to the biomass nitrogen content”. The proposed experiment attempts to understand these effects by analyzing the nitrogen and lipid content of algal cultures grown in space and on Earth to determine the amount of nitrogen absorbed and how it affects algae composition. The results can then be applied to determine how effectively algae can be grown in a microgravity environment and to better understand the nutrient quality of space crops, providing a stepping stone for future research. 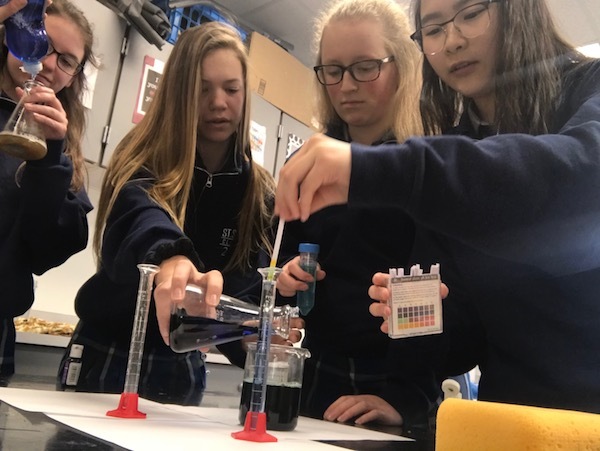 Amelia Porter, Marissa Spreitzer, Arianna Darling, and Hannah Nguyen are engaged in determining the type of grey water they are using with their project to grow carrots in grey water on the International Space Station. How would grey water affect carrot seeds in microgravity? During our research we learned that astronauts grow a few inches taller while living in microgravity. Will germinating carrots in grey water affect how they grow? If we ever live on another planet, we will need a way to recycle our water because it will be limited. Grey water can be anything from the water you shower with to the water you cook with. Our experiment is designed to see if we can grow carrots seeds using grey water in microgravity. Specifically, we used Dawn dish soap, which is all natural to make grey water. Carrot seeds were chosen for this experiment because they are high in protein, have a high source in antioxidants, and vitamin A. They also protect eye health, decrease the risk of heart disease and stroke, protect against cancer, help maintain oral health, boost skin health and wound healing, and protect against brain health. Growing carrots does not take a lot of work. The germination period for a carrot seed is between 14-21 days. Once they are grown, they can be cooked and can become compost. The green leaves can also, be eaten. If carrots can germinate in microgravity with grey water, we will not have to waste purified water to grow plants. What are the effects of microgravity on papaya seeds in a sponge medium? We chose papaya seeds because one major food resource from the Maldives is papaya. Our group is researching the Maldives for a project because Maldives is currently undergoing climate change. Our goal is to successfully germinate papaya seeds in microgravity and draw conclusions regarding space and its effects on seed germination. One papaya seed can produce 200-400 seeds, making it a valuable export (“Kamiya Papayas”). Next, this experiment will provide data about germination in space to help grow papayas in space when papayas may no longer be able to grow in the Maldives. Papaya helps reduce the risk of cancer, heart disease, diabetes, supports bone health, lowers heart rate, etc. (“Papaya Fruit: Health Benefits, Uses, and Risks”). This could help future space missions by allowing astronauts to go on longer missions to space, bring some tastes and smells of Earth with them, and add a variety to the astronaut’s diet. Inside our Type 2 FME, Volume 1 contains a sponge medium and 2 papaya seeds. Volume 2 contains two milliliters of tap water because that is a sufficient amount of water for papaya to germinate according to our research. We chose a sponge medium because a sponge would not overly saturate the seeds, but keep them damp enough for the seeds to be able to germinate. Lastly, we will tell the astronauts to unclamp the clamp 2 days after arrival and shake vigorously for 15 seconds. Investigation of greywater usage on the germination of Brussels sprout seeds in a microgravity environment is essential to our future in colonizing space. Brussel sprouts alone provide many needed key benefits: structure for various objects. The nutritional value of the plant consists of these vitamins: fiber, vitamin K, vitamin C, and vitamin B6. Also, studies have shown that consuming Brussels sprouts reduces the chance of developing cancer. Stems of the plants can serve as a strong base for building structures. Our experiment involves brussels sprout seeds being put in Type 2 tubes and mixed with some water and soap. Occurring naturally, the Brussels sprouts seeds are placed in 1.5 g of Miracle-Gro Potting Mix. Using soap helps improve the efficiency of the spacecraft by reusing soapy water after the astronauts clean themselves. According to Dr. Enid Contes of NASA, all water on the ISS travels through its ECLSS Water Cleansing System, including runoff from bathing. In order to replicate this, we decided to use 3 mL of the mixture, 2.5 mL of Citizens tap water and 0.5 mL of Mrs. Meyer’s Clean Day Detergent. The germination process of Brussels sprouts can take 7-14 days. 14 days before undocking, the water mixture and the seeds in the dirt are to be combined with gentle shake for 15 seconds. A gentle shake for 15 seconds would manipulate the soil of Earth. The earth’s soil isn’t a perfect combination of water and soil; instead there are pockets of water and dense soil. 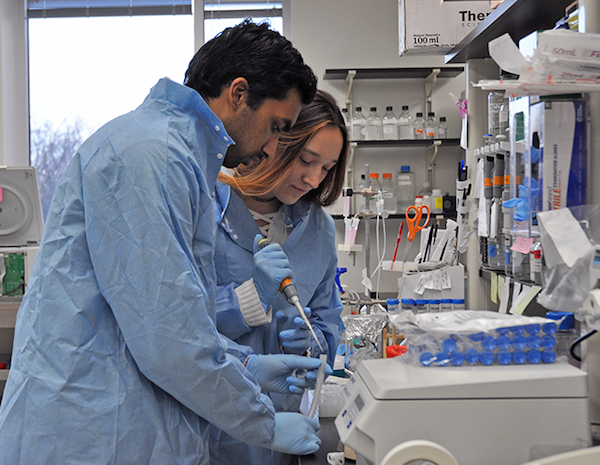 Rushi Challa (Biology and Psychology double major at UMD College Park) and Natasha Ivanina (Biology: Cell Biology & Genetics major at UMD College Park) perform FME volume optimization measurements in Dan Nelson’s bacteriophage lab at the Institute for Bioscience and Biotechnology Research. The 21st century is the time for introduction of bacteriophage therapy for disinfection of food and water, in addition to the replacement of antibiotics. Bacteriophages are effective and environmentally-friendly viruses that destroy bacteria, yet remain harmless to humans. Studies on the ISS have uncovered that extreme environmental conditions of space, including low gravitational pull and radiation from galactic cosmic rays, induce greater mutation rates and bacterial changes such as increased biomass, metabolic activity, and antibiotic resistance (observed as a thicker-developed peptidoglycan cell wall) compared to bacteria on Earth. In addressing these growing features and resistance, our project focuses on the effect of microgravity on the infectivity rate of a T4 bacteriophage, opening the question of whether or not phage effectiveness will heighten or appear compromised in microgravity. We propose sending freeze-dried samples of T4 bacteriophages and their target bacteria, E. coli, into orbit. Upon arrival both will be activated, bacteria will begin to replicate, and the phages will start their infection cycles. After a two-day time period, we will fix the samples and bring them back to Earth for analysis through transcriptome profiling and observing gene expression changes induced by the microgravity environment. Observing these factors could reveal greater expression of genes coding for certain infection enzymes of the phages, such as integrase (thus, a greater infectivity rate). In the event that we observe a heightened efficacy of phage activity complementary to the respective bacterial growth, this may suggest that bacteriophages could provide a powerful alternative to traditional antibacterial agents. Loss of bone density in astronauts is a serious concern for long-term space exploration and/or interplanetary colonization. One of the causes of bone density loss in astronauts is the negative effect of microgravity on osteogenic differentiation, the process by which human mesenchymal stem cells (hMSCs) turn into osteoblasts (the cells that produce bone matrix). Simulated microgravity is known to decrease osteogenic differentiation in favor of other differentiation pathways. Meanwhile, studies on Earth have shown that seeding hMSCs onto various 3D scaffolds can encourage osteogenesis. Culturing hMSCs onto a 3D scaffold and inducing osteogenesis is an important technique in the bioengineering of bone tissue for regenerative medicine applications. Polycaprolactone (PCL) scaffolds are particularly appropriate for bone grafts because they provide structural support for transplanted bone tissue, while maintaining osteoconductivity, which is the ability to recruit host bone cells from the recipient. If hMSCs undergo osteogenic differentiation on the PCL scaffold in space, this can prove to be a vital technique in administering treatment to astronauts suffering from bone density loss. We propose to study the rates of proliferation and osteogenic differentiation of MG-63 cells (a model cell line for hMSCs) seeded onto a 3D-printed PCL scaffold in microgravity. The overall goal of the experiment is to determine if using a 3D PCL scaffold can increase osteogenic differentiation enough to mitigate the negative effects of microgravity and perhaps, with further investigation, synthesize bone tissue for regenerative transplantation into human bodies in space. As space exploration takes a step into commercial territory, the number of potential medical emergencies that can occur during flight could increase with the duration of the trip. This raises the question of the efficacy of surgical practices in microgravity. The most ubiquitous material used in surgery are dissolvable sutures. Dissolvable sutures are composed of collagen protein. Previous studies on crystallized collagen in microgravity indicate an increase in the tensile strength of the protein. Despite this, a NASA study conducted on mice raised in microgravity reported an overall degradation of collagen in the skin. Therefore, what these changes mean for collagen in dissolvable sutures is not yet clear. In this proposal, we aim to test whether the collagen present in widely used chromic catgut sutures in microgravity changes its behavior under microgravity. Specifically, we use a biologically derived proteolytic enzyme to measure the rate of digestion of collagen in microgravity. Our preliminary data obtained on ground suggests that the rate of digestion of the sutures depends on the time of exposure of collagen to the enzyme, and on the dosage of the enzyme. Because this study will provide an understanding of how collagen in sutures responds to enzymatic activity in space, it will have an impact on helping to ensure the fitness of future travelers. We anticipate that the results from this study could also give insights into how microgravity could affect collagen in general, given its importance in maintaining skin and bone health. 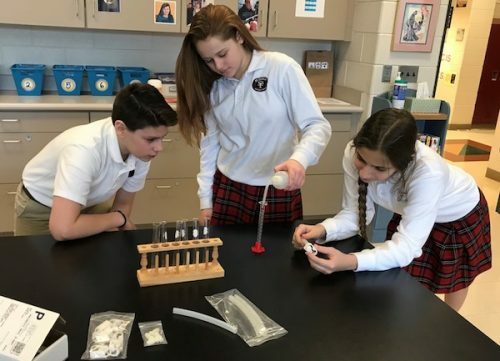 St. Fabian 7th graders Eve Hajjar, Katie Kowalyk, and James Tringale as they practice measurements for their flight experiment. The experiment being proposed is Planaria tail regrowth. This experiment will contain ten planarian worms, 2.5 mL of pure caffeine, and 2.5 mL of ethanol. The team is cutting the Planaria worms’ tails off before it gets to space with a knife. Then the team will pour the chemical, ethanol, on the worms to stop it from growing a tail until it gets in space. If the experiment gets chosen, the tube containing the experiment (left to right) will be and an empty space to have more room to shake, 2.5 of ethanol and the worms, and then 2.5 mL of caffeine. This experiment is to see if the Planaria worm will grow a similar way as it does here on Earth. It normally grows right where the cut was first made. According to Helen Pearson, on Earth, it takes about two weeks for the worm’s tail to grow back. What some people don’t know if Planaria worm’s mouths are located in the middle of their bodies so the worms will have food to survive until the worms arrive in space. Ethanol is a substance that slows down cell regrowth. Ethanol is found in gas. The caffeine the group is using the type caffeine that is found in soda. It will cancel out the ethanol that will slow down the worm’s tail repopulation. The caffeine will speed up the growth after it has been delayed by the ethanol, therefore canceling each other out. Finding the mass of Iron. We are proposing to send a 1-gram piece of iron into microgravity to see if it will rust. In the three-volume tube, on one end will be 1-gram of iron, in the middle will be the Fiji water, and at the end will be 0.1 grams of cotton. On day one, the clip between the water and iron will be removed, and the experiment will begin. Should the iron rust here on Earth in gravity, but not in microgravity, that will tell us a great deal about how microgravity may affect rust. This is an important experiment because rust in space could pose a serious threat to people and living things in future colonies or spacecraft. If there is a rusty, decaying part inside the spacecraft, there could be a rupture and a loss of pressure. That is very bad for anything or anyone onboard. By doing this experiment, we may gain insight on how and if rust forms in microgravity. On return from ISS, the last clip will open revealing the cotton. This will soak up the water, and stop or slow the experiment so the gravity on return to Earth doesn’t affect the experiment. Before and after, we will weigh the iron to see any change. The Archimedean Principle will also be used to measure rust growth. The experiment the team is doing is testing if the pH of pig’s blood changes when it is in microgravity. Before sending the 6mL blood to space the pH of the blood will be tested using a pH meter and dipping it into the blood. The pH of the blood sample on Earth will be recorded. The 6 mL of pig’s blood and 2 g of Adenine powder will be separated by the Type 2 FME Test Tube, which has 2 volumes included in the test tube. When the blood is in space, the antibiotic, Adenine, will be added to preserve it and help maintain the microgravity effects. Adenine is an antibiotic that preserves any type of blood (Peck). Once returned to Earth, the pH meter will be dipped into the blood 3 times, then the average will be found, and the data will be collected. When the experiment is returned, the pH will be calculated using the pH meter testing it 3 times, then finding the average which will help discover if the pH changes. This is being proposed because the team enjoys learning about the pH scale and this is an opportunity for the students to learn about it in a different perspective. It is interesting to see how different aspects of space that we do not have on Earth, like the change of gravity, will affect the pH of pig’s blood. The team decided to choose how micro-gravity affects oxidation. The experiment is going to measure how quickly oxidation occurs on steel. This was chosen by the team because of the team’s interest in oxidation and also because the team is unable to predict the results. The team knows that steel rusts or oxidizes faster in salt water so the team chose to use salt water instead of pure oxygen. The materials the team is using for this experiment are 5 ¼ in diameter low-carbon steel balls, 3mL of distilled salt water and 6mL of Penetrol (coconut oil will be used as an alternative if Penetrol is not flyable), a substance that will seal out air moisture to stop the process of oxidation from continuing. The team will be using Type 3 FME Mini-Lab. The team will have the astronaut unclamp one of the clamps on arrival and have them unclamp the second clamp and shake gently to mix the rusted steel balls with the Penetrol. When the steel balls are returned the team will compare the weight of the balls taken before to the current weight. Will diffusion with colloids happen in space? We want to see if colored tap water will diffuse into colloids. The colloid that we will be using is gelatin. Gelatin is made out of leftover meat from manufacturing, such as pork skins, cattle bones and horns. This is also including cartilage. The colloid and the colored tap water will be sent into space. We will see if the colored tap water diffuses into the colloid, more or less in microgravity, compared to Earth. We are doing this to see if colloids can diffuse into cells faster, or slower in microgravity, so that we can see if something like, milk can enter the cell and make the cell healthier. Colloids are large molecules of one substance. Examples of colloids include gels, emulsions, and sols. Colloids cannot be separated by ordinary filters. The particles in colloids do not settle. Fluid diffusion is the thermal movement of a liquid or a gas, when the temperature of the particles is above zero. This means that if one fluid has more density then it will sink under the one with less density. We have one primary question: How will mock-streptococcus bacteria be affected in the presence of microgravity? The results of this experiment will help scientists discover if microgravity will affect the way the bacteria will develop. Immune systems are weakened in space and we would like to see whether mock-streptococcus bacteria will change in microgravity. This will help scientists create new medicines to be used in space. We are not allowed to bring the streptococcus bacteria into our school’s classrooms. We will be switching out the streptococcus bacteria for a bacteria sample from our school. The bacteria our group will be using is a sample from our lunchroom drinking fountain. We grew many different kinds of bacteria on petri dishes for a science class experiment. When we took this sample it ended up different from the others. This sample was a different color and appearance. It looked like beads while the others appeared to be in moldy, fuzzy colonies. Using this sample will protect us from getting any of the students in the classroom infected with streptococcus. We would like to see how different the bacteria sample is when it comes back to Earth. So, we will check three things: how different it looks, how fast it expanded to the other side of the FME tube, and if there are any deformations in the growth of the bacteria while microgravity was acting on it. The purpose of this experiment is to investigate the effect of microgravity on gravitropism of Brassica Rapa seed germination. We chose Brassica Rapa due to its extremely adaptive characteristics and its quick life cycle (one month on Earth). Plant growth is directly related to responses to stimuli, known as tropism. The two types of tropism that affect plant growth are phototropism (response to light) and gravitropism (response to gravity). On Earth, plant roots grow towards the center of the Earth due to gravitropism. The plant hormone indoleacetic acid (auxin), is responsible for the growth and elongation of plant stems in addition to inhibiting the growth or root cells. (Vogt, Mareno, Countryman, 2017, p.11). We have hypothesized that the microgravity environment will decrease seed germination due to the absence of the external stimulus of gravity. Will Pomegranate Lose its Key Nutrients from Microgravity? Our proposal is to see if Punica Granatum (pomegranate) seeds will still retain its nutrients after being exposed to microgravity and it’s reaction to exiting Earth’s atmosphere. Due to the lack of oxygen, we assume the pomegranate seed will lose its key nutrients. The seeds are high in vitamin C, vitamin A, folic acid, vitamin E, fiber, potassium, iron, and calcium. These items are needed to help support our body fluids, pH balance, vision, immune system, reproduction system, and protects cells from damage. Pomegranate seed oil offers potent chemoprevention against breast, prostate, and other common human cancers. From this experience, we will dilate our knowledge determining whether or not microgravity will drain out the nutrients in pomegranate seeds. The backdrop for our project centers on recent new stories related to the safety of our drinking water supply. From school building water fountains to the contamination of our entire city’s water supply water safety has been a source of concern for many. The water we drink, use to cook, use for laundry and watering our plants or lawns, if not from a well, is taken through a water purification process that removes substances deemed harmful from the water. Lead is a substance that is harmful and can be found in our drinking water. The Environmental Protection Agency states that between 10% and 20% of our lead exposure is due to contaminated water. In young children, lead can have profound and permanent adverse health effects, particularly affecting the development of the brain and nervous system. In adults it causes increased risk of high blood pressure and kidney damage. In women who are pregnant, high lead levels can cause miscarriage, stillbirth, premature birth and low birth weight. You can’t remove lead by boiling the contaminated water. Our project centers on how effective lead removal by precipitation would be in microgravity. Could one “get the lead out” as effectively in microgravity as they could here on Earth. We are interested in measuring not only percent yield but also atom economy. Using the Green Chemistry Principle, Atom Economy, we want to ensure that the process we selected limits waste. There may be other reactions that would produce a higher atom economy and thereby would be better for our environment. 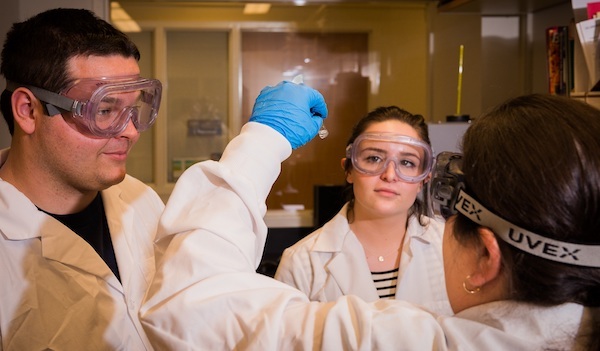 Stockton students Christina Tallone and Daniel Schneider work with Dr. Pamela Cohn to optimize crosslinker reagents to study the effects of microgravity on self-assembly of drug delivery systems. With the emergence of controlled release pharmaceuticals and their benefits in our society, the proposed experiment will contribute valuable information to this new field of study. Hydrogel drug delivery systems are incredibly valuable and used in several important aspects of medicine: from anti-cancer drugs to insulin. However while assembling, hydrophobic drugs, like many psychoactive medications, form polydispersed micelles and are not useful in drug systems. Polydispersed micelles are unpredictable and deliver medicines at varying rates. There is currently no known method for assembling monodispersed micelles around hydrophobic molecules. The proposed experiment will test to see if microgravity conditions will result in monodispersed micelles, which could be used for drug delivery. The experiment includes the self-assembly of PEGMA around indigo dye, a hydrophobic molecule, in place of a drug. An PEG dithiol crosslinker will add stability to the micelles formed. With the addition of microgravity, we are intending to find monodispersed micelle formation. If microgravity leads to monodispersed micelles, the more favorable formation, pharmaceutical companies can use this information in preparation of these important drugs, that otherwise cannot be delivered using these systems. Outside of pharmaceuticals, this experiment could also have future implications for drug delivery applications with humans participating in space travel, progressing the research of hydrogels, and the increasing the level understanding of self-assembly as a whole. Our proposed experiment will test the effects of microgravity on the osmotic pressure gradient of a supersaturated solution. Solutions with different concentrations of free particles attached by a semipermeable membrane will undergo osmosis. An osmotic pressure gradient will be created that will move water across the semipermeable membrane. The strength of the osmotic pressure gradient is partially dependent on the tendency of free particles to spread as far apart from each other as possible. In a supersaturated solution, gravity will pull excess molecules that failed to saturate to the bottom of the solution. We hypothesize that in microgravity the excess molecules that failed to saturate will move freely throughout the solution and result in a higher osmotic pressure gradient, and thus increase the entropy of the system. We have designed an experiment such that, as osmosis occurs, a pressure gradient will arise that will oppose the osmotic pressure gradient. When the pressure gradient is strong enough to counteract the osmotic pressure gradient, osmosis will stop. We will then be able to calculate the osmotic pressure gradient by first finding the pressure gradient created in our system. We will use this method to measure the difference in the osmotic pressure gradient of a supersaturated solution on Earth and in microgravity. Our findings will aid the ongoing investigation of how osmosis can be used in microgravity water filtration systems. Ever since the start of the space age, astronauts have spent thousands of hours in orbit performing various experiments, and learning about the cosmos. Since their work is paramount for humankind, their well being is a top concern. One of the greatest dangers to astronauts’ health is bacterial infections. Since proper healthcare is unavailable in orbit, antibiotic-resistant bacteria can become fatal. Considering that microgravity suppresses the immune system, and antibiotic-resistant “superbugs” are on the rise, it is imperative to study the effects of microgravity on microbial antibiotic resistance. This project will use type 2 FME Mini-lab to grow Bacillus subtilis in LB growth medium. After the spaceflight, multiple tests will be performed on the bacteria samples to identify antibiotic resistances. In addition, the sample’s genome will be sequenced to identify the reasons behind the resistances, if there are any. No matter the result of the experiment, it will contain valuable data that might act as a foundation for future studies. 7th graders Kripa Patel, Emma Pallitta, Cecilia Perez, and Paige Lieberman refine their experiment on tardigrades. Tardigrades are microscopic animals that can survive almost anything. They were even proven to survive in microgravity, but tardigrade eggs haven’t hatched/developed in microgravity. So our question is: Are tardigrade eggs able to hatch and develop in microgravity? Based on our research, tardigrades can survive in any temperature, and they can survive up to thirty days without food or water. No one knows about their eggs in microgravity, so the results of this experiment will justify that information about tardigrades. One of the reasons that we have a lot of knowledge about tardigrades is because we found an expert on tardigrades. Her name is Emma Perry, and she professes at Unity College in Maine. She has given us a lot of information about tardigrades, including a packet with facts about them, and a video about how to find them. We tried to find a few tardigrades, but our science class does not have a dissecting microscope with light coming from the side. Otherwise, we cannot see them. So she has agreed to give us twenty tardigrade eggs, ten for here and ten for the space station. Tardigrade eggs are able to survive for months without water, and they will not start to develop until they get in water, which will be on the space station. The expert has been extremely helpful for our experiment and us. On the space station, the tardigrades will have water, to start their growth, moss for food and a fixative to end the experiment. Our project is on the cell division of Staphylococcus epidermis with nutrient agar in microgravity. We want to see how microgravity affects the cell division of the bacteria. That also means, in a more scientific way, that we want to see how much Staphylococcus epidermis grows, or spreads, in microgravity. In our FME there is the Staphylococcus epidermis in volume 1, the nutrient agar in volume 2, and in volume 3 is the Puromycin solution. In order for the Staphylococcus epidermis to start spreading, the FME will unclamped at clamp A and shaken lightly on U-14 for the agar and the Staphylococcus epidermis to mix, so it can start spreading. Before we send it back to Earth, on U-2, the FME will be unclamped at clamp B and shaken lightly to mix the fixative with the Staphylococcus epidermis so it stops spreading for observation. Puromycin solution is the fixative in which we will use, to stop the Staphylococcus epidermis from spreading or growing anymore so we can examine the results upon receiving our FME. How does Microgravity Affect the Growth of Bacillus subtilis Colonies on Agar? Our experiment for SSEP Mission 12 is; how does microgravity affect the growth of Bacillus subtilis colonies on agar? When we first started this project we wanted to know if ampicillin would work in microgravity because we wanted to know if it would against salmonella bacteria, which a study proved is 3-7 times more virulent in microgravity. We contacted John Helmann who directed us to his colleague, Wayne L. Nicholson. Nicholson told that the experiment we were planning to do had already been done on three different occasions with no effect on the growth of Bacillus subtilis. He helped us find an experiment that had not been done in microgravity. Therefore, we decided that our Mission 12 SSEP experiment would be studying the colony shape and color of Bacillus subtilis on the surface of the agar in microgravity. We chose to focus on the growth of Bacillus subtilis, something that past experiments hasn’t done. We plan on using a type three FME for our project. The first section will contain agar. The second section will have Bacillus subtilis. Finally, the last section will contain a fixative solution. In this case, we will be using puromycin solution. We chose this experiment because Bacillus subtilis causes food poisoning and contaminate food. As space travel becomes more frequent with more people, food poisoning and contamination will become a real threat. Our experiment is all about learning about Bacillus subtilis in a unique way that will ensure the safety of our future. 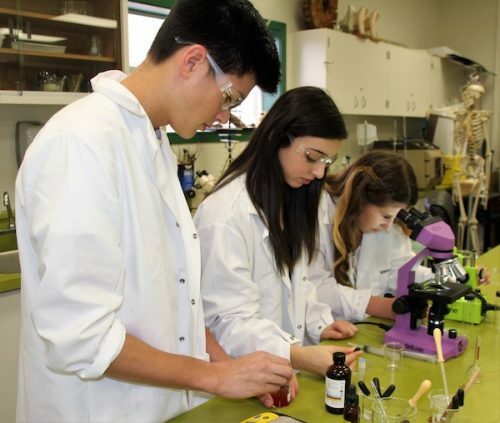 Finalist out of 173 teams, Belen High School juniors Savannah, Iris, Tamika; freshman Evelyn; and seniors Julia and Isaiah work to package tomato leaves for preliminary testing of decomposition rates. What’s more thrilling than the miracle of life? Leaves! Well, dying, decaying leaves. We’re sure everyone’s just as excited. Our experiment involves the use of tomato plants, which directly relates to current astronaut research into sustainably growing food in space. 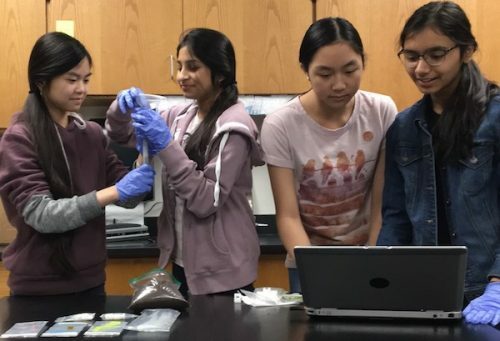 Our group plans on investigating how the process of plant decomposition reacts to microgravity conditions present aboard the International Space Station (ISS). In turn, our research group will run the same experiment on Earth in order to compare the results gathered on the ISS. In collecting this data, conclusions will be made regarding differing/similar decaying plant matter response. Steel is a material widely used on Earth for objects in our everyday life and for space exploration. Our experiment will test how oxidation in microgravity affects steel. Iron III oxide is produced by the reaction of iron, oxygen, and water – Fe2O3. 4Fe + 3O2 → 2Fe2O3. Rust is produced by iron oxidation, which is a reddish orange, dirt-like substance. A type 2 FME will be used to combine steel wool and humidified oxygen in the microgravity environment. We will be controlling the amount of oxygen and water in the FME tube to insure that the reaction is complete before returning to Earth. The result of the experiment will be compared to the controlled experiment conducted on earth. Physical characteristics will be examined, such as the amount of rust and any distinguishable differences in the formation of the rust. The intention of the experiment is to help further gather information about steel in space and if it could have the potential to serve other purposes in a microgravity environment. What is the Effect of Microgravity on Radish Rate of Growth Compared to Here on Earth? For our experiment, we, “The Allstars”, have discussed, to compare the effect of Microgravity on the growth’s rate of radishes to Earth. We chose this experiment to analyze if the growth’s rate of the radish plant will be different between Earth and Microgravity. To answer the question we proposed, we will test our experiment, twice. In our experiment, we will be sending an FME Type 3 Tube with 3 radish seeds, sterile cotton, purified water, and NBF 10% formalin to space. A duplicate of the same experiment, will stay on Earth. Once the experiment that was sent to space is back to Earth, we will compare the growth of the radish seeds that were in space to the radish seeds that stayed on Earth. Students from Wellsville Secondary School in Wellsville, NY took a team vote to select a proposal topic, and worked together on their experiment. From left: Brandon Bailey, Tyler Watson, Nichelle Dannheim, Trinity Roulo, David Graham, Shannon Nye. Vitamin C, or ascorbic acid, is a water-soluble vitamin that is essential to functions in the body. Vitamin C aids in the synthesis of collagens, important proteins found in connective tissues. Collagens are vital to wound healing and create the fibers of the subepidermal membrane-muscle sheath system in planarians, which suggests that ascorbic acid will promote regeneration in planarians. Our experiment aims to find evidence on the effects of ascorbic acid on the rate of planarian regeneration. Consisting of three Type 3 FME Mini-Labs, our experiment utilizes two earth-bound Mini-Labs and one that will experience the effects of microgravity. The three volumes allotted with the Type 3 Mini-Lab will contain an ascorbic acid solution, planarians and food suspended in water, and a fixative. One of the Mini-Labs on Earth will not have the ascorbic acid and will act as an overall control group in the experiment. Upon the return of the Mini-Lab to us, we will analyze the physical characteristics of the planarians from all three Mini-Labs to determine the validity of our hypothesis. We will use measurements of physical characteristics and an additive point system where points are awarded based on physical features that were regenerated to compare our results. The question we are researching is whether or not urokinase will break down blood clots faster in microgravity. There have been few experiments on biological features of the human body. There have not been any experiments with blood clots, so this could be a great help for the future in case someone happens to get a blood clot while in space. This information is unknown and we would like to explore it and find the rate at which urokinase breaks down blood clots. Urokinase protein is found in the body and is produced in the kidneys. Urokinase breaks down blood clots in the lungs and in the eyes after glaucoma surgery. 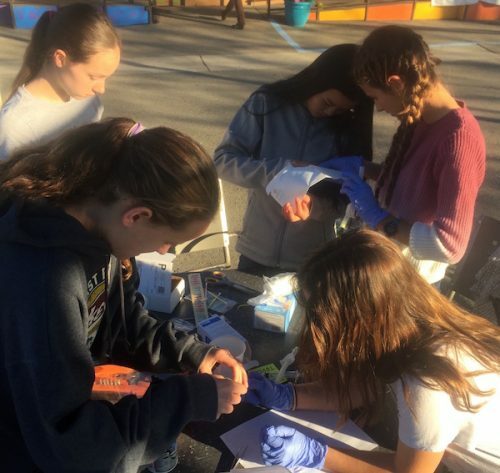 We thought of doing this because if we plan to live in space one day, we will need to know if blood clots are broken down faster or slower in microgravity. We plan to answer this question by doing the same experiment on Earth as on the International Space Station (ISS). We will measure the blood clots in both experiments and then determine how much they broke down. Comparing how much was broken down will give us the answer to our question on if blood clots break down faster in microgravity with urokinase. Multiple holistic substances possess antimicrobial properties acting as natural alternatives to traditional medicinal treatments such as antibiotics. Historically, plants known to contain such antimicrobial properties have been widely used to combat and manage the proliferation of infectious disease throughout a population. As pathogens continue to adapt and develop resistance to antibiotics, increased attention has been brought to holistic options and their effectiveness in eradicating certain infections. Cinnamon and cardamom are known to provide antibacterial qualities against many strains of bacteria. As bacteria has been found to rapidly establish resistance to standard dosages of antibiotics under microgravity, it is pivotal to observe alternative forms of medicine under such conditions. Samples of cinnamon and cardamom oil combined with human non-pathogenic LM Escherichia coli 1090 (G-Rod) will be contained on either sides of the type 3 FME mini lab. The center section will contain solely E. coli, and the sample will remain refrigerated until arrival on the ISS, where it will be removed from refrigeration and allowed to grow. The experiment will be replicated on Earth as a control group, and the volumetric ratio of all three mixtures will be equivalent. Observations of bacterial growth under microgravity will provide a general insight into the effectiveness of cinnamon and cardamom oil against common pathogens. Upon return to Earth, each sample will be carefully inspected using a spectrophotometer to determine a quantitative value of surviving colonies. Additionally, gram staining techniques will be utilized to identify any bacterium as strictly E. coli, accounting for possible contamination. 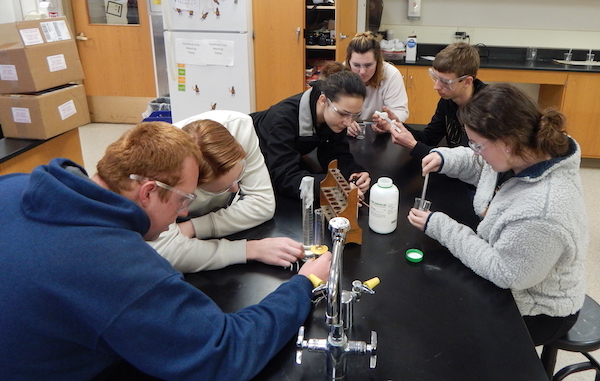 Students measuring the amount of polyacrylate for volume 1 of the FME Mini Lab. We propose that sodium polyacrylate will absorb water in microgravity and serve as a growth medium, which will allow embedded radish seeds to have access to water so they can germinate. 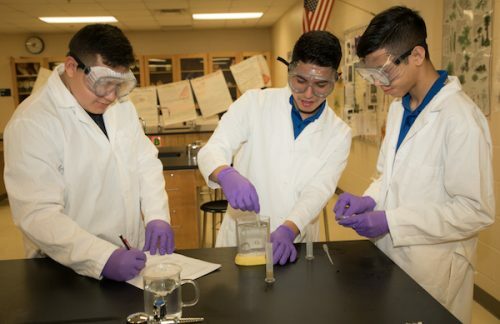 Student researchers discovered sodium polyacrylate will absorb water and increase in its size to form a polymeric gel on Earth. This allows for it to become a good medium for seed germination. We plan to embed radish seeds into sodium polyacrylate in the Type 3 FME Mini Lab and then expose the mixture to water in space. If microgravity does not have any effect on the ability to absorb water then we predict the radish seeds will germinate. If our hypothesis is true then it would be extremely useful information. It would allow us to know that sodium polyacrylate in its lightweight form will mix with water in microgravity to form a polymeric gel that will serve as a growth medium for seedlings. This will be useful information as far as seed germination and growing plants in space in the future and could potentially lead to further studies such as determining if sodium polyacrylate is a good substance for other purposes such as protecting fragile samples being brought back from space. Does the effect of microgravity affect Brownian motion of the particles in a liquid and therefore affect whether a powdered substance will not only diffuse but remain that way? For our experiment the solute we use is Kool-Aid. It is granular, inexpensive, and easy to acquire. When diffused with water, it becomes a fruit-flavored soft drink. Our experiment focuses on whether the powdered substance, the Kool-Aid, will mix with the solvent, water. 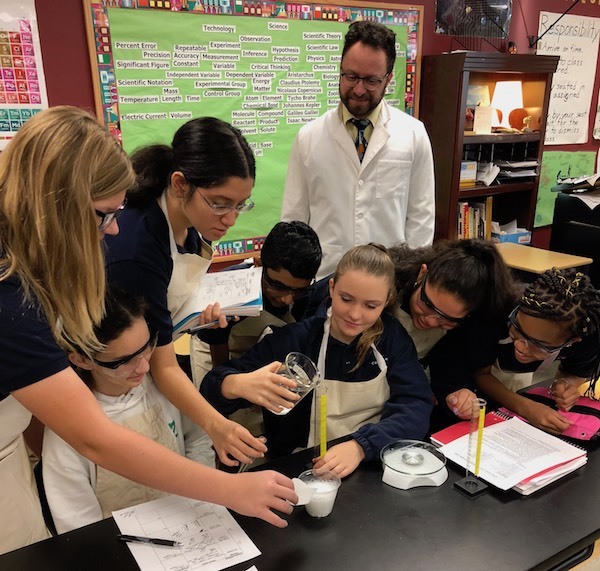 Once the powdered substance has been mixed with the solvent, shaken for a specific time period, and allowed to diffuse, we will wait for a specified number of days and then add the stop agent, gelatin, to solidify the solution. With the solution solidified, we can analyze our results by observing the diffusion of the Kool-Aid particles as evidenced by the color of the gelatin. Our experiment can improve the quality of life for astronauts, and as space travel becomes more advanced, vacationing and colonies on the moon will eventually become possible. Necessities such as liquid medicine and baby formula are solutions. Whether they will remain as solutions when they enter microgravity is what we are seeking to answer with our experiment. The main goal of our experiment is to investigate the effects of microgravity on roots given root hormones and the resulting amount of adventitious roots found afterwards. Our background research from Clemson University has shown that muscadines are grapes native only to the Southern United States. Additional studies from Clemson University have found that muscadines are rich in antioxidants and contain cancer fighting properties. In addition, the studies determined that muscadine grapes have approximately 40 times the antioxidants than any other grapes. This project consists of growing muscadine vines in space. We want to create a root hormone solution by mixing Miracle-Gro root hormone with water and then release it to the plant slowly via a sponge. This would potentially allow the vine to create adventitious roots and buds while in space. After the experiment has been conducted aboard the International Space Station, the vine will be killed with a sodium chloride solution and sent back to us to be compared with the ground experiment. Once we have this information, we can use it to understand how food can be grown in space, or possibly find out how to extract the cancer fighting properties, known as ellagic acid, which is specifically found in the muscadine grapes, so they can be utilized in space for medicinal purposes. 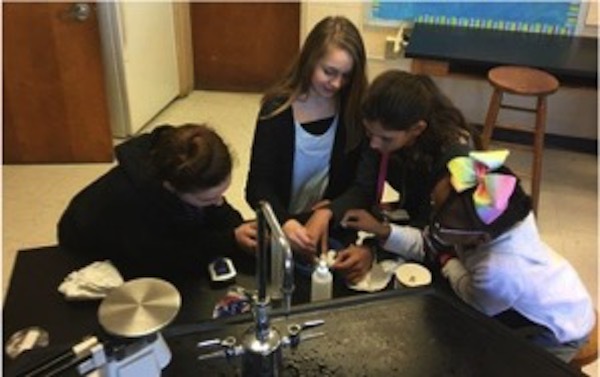 Carter Middle School students examine preflight teeth and test the pH of saliva. Tooth decay is an issue that all people face. Most people receive dental services about every six months and additionally as needed. The estimated time spent in space is approximately six months. Dental services are limited in space, therefore; it would be valuable to examine the effects of tooth decay in microgravity. While in the micro-gravity environment, astronauts lose calcium in their bones. Though sometimes confused with bones, teeth are composed of a calcified tissue called dentin. Because teeth play a major role in the digestive system, it is important to keep one’s teeth from decaying. Tooth decay is caused by sugary foods and acids. Plaque is a coating on teeth that is made up of food, bacteria, saliva, and food debris. Usually it comes off when one brushes, but if it doesn’t come off, it can and will cause various problems (Tooth Development, Loss, Replacement, and Decay). Plaque builds on teeth for up to twenty minutes after eating. Over time, the plaque emits acid which destroys the enamel and causes tooth decay. The acids in saliva will also start to decalcify teeth which makes it easier for teeth to decay. When the tooth returns from space, we will look for changes on the tooth as well as in the amount of calcium and in the pH level in the saliva. Ribonuclease A (RNase A) is a protein that digests RNA strands rapidly. Our proposal centers around crystallizing this protein in the microgravity environment present on the ISS in order to analyze whether these conditions can produce crystals that will allow for a more detailed understanding of the protein’s structure. To do this, we plan to crystallize samples of the aforementioned protein aboard the ISS in conjunction with identical samples on earth, the ground truth test. Once the samples are returned to Earth from low Earth orbit (LEO), we will compare these two crystal structures using X-Ray crystallography. With these results, we hope that further research could be done on the possible medical applications of RNase A. This protein was once considered to be a possible treatment for killing cells infected or affected by diseases such as cancer, but due to its indiscriminate nature of RNA digestion, it would be fatal to healthy cells as well. However, the human body naturally produces powerful RNase A inhibitors whose relative effectiveness is dependent on how well it binds to the protein’s active site. We believe that a more complete understanding of the structure of this protein could be utilized to direct the protein to attack specific targets, such as cancer RNA. Dinoflagellates are single-celled phytoplankton with two flagella and occur in large numbers in marine environments. They have both plant and animal characteristics. The species Pyrocystis fusiformis are large bioluminescent algae. Chemical reactions occur within their cells and produce flashes of light at night (Frost, 2016). Their cells are tapered at the ends and can reach one millimeter in length. Dinoflagellates are the second primary marine producers. They are important components of the microbial life in the oceans and help channel significant amounts of energy into planktonic food webs. We will be studying the effect of microgravity on the cell structure of the Pyrocystis fusiformis dinoflagellate. Bioluminescent species have been estimated to have evolved at least forty times in the past (Valiadi and Iglesias-Rodriguez, 2013). Since these species evolve easily, we predict that the cell wall may change size and shape in microgravity. However, we do not think its function will be affected. We hypothesize that the cell wall will become thicker in a microgravity environment and possibly fuse together. When they fuse together, they enter a semi-dormant state (Arrington, N.D.). Since these dinoflagellates illuminate when they are stressed by motion, we are hopeful that, in the future astronauts, could use these dinoflagellates as warning lights that could detect vibrations and alert space crews to danger. Would Lemnoideae Seeds Germinate in Microgravity? 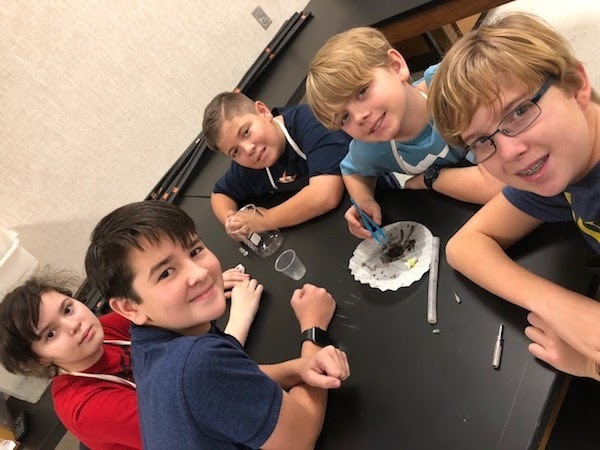 BISD’s selected flight team from Rasco Middle School are checking to see if their seeds germinated in their ground trial. Why would a fruit producing, oxygen making, and water purifying plant be amazing to send to microgravity? That is something we were wondering and that is why we decided to do this experiment. Lemnoideae provides vital resources. Some of which are water, oxygen, and food. These things can help lead to farther space flights in the future. NASA would not have to bring a lot oxygen tanks if this project works. Plants provide us with oxygen and food. Another reason is that lemnoideae doesn’t have roots. This is because it typically grows in water. Lemnoideae can easily float on water. We feel that this plant could change the world for many reasons. Some reasons are that lemnoideae makes an edible fruit called an utricle. The astronauts can eat this for emergencies. In the future when we perform long-duration human spaceflight, it may be possible for the astronauts to eat some fruit called a utricle. Lemnoideae is also a water based plant so it has to grow in the water. If You Put Lactobacillus Rhamnosus GG in Microgravity Will It Reproduce? Rhamnosus GG is a probiotic bacteria found in the gastrointestinal. The bacteria is from a large bacterial family. Lactobacillus rhamnosus is a bacteria that originally was considered to be a subspecies of L. casei, but later genetic research found it to be a species of its own. Lactobacillus Rhamnosus GG has many uses and can help your body. According to Everyday Health Media the bacteria can prevent bad bacteria from growing in the stomach and intestines, it can also prevent diarrhea. According to Joseph Cohen (CEO of SelfHacked, a health company) this bacteria can alleviate asthma, allergies and dermatitis. It also has weight reducing and anti-cancer properties. Probiotic bacteria are also proposed to benefit health in the human body by three general mechanisms (National Center for Biotechnology Information, U.S. National Library of Medicine) one of the mechanism “is the capacity of certain probiotic strains to enhance the epithelial barrier function by modulating signaling pathways, such as nuclear factor-κB (NF-kB), Akt and mitogen- activated protein kinase (MAPK)-dependent pathways, which lead to for example the induction of mucus, or increased tight junction functioning.” It will benefit the ISS because Lactobacillus Rhamnosus GG will prevent bad bacteria from growing in the intestines/stomach and if it will reproduce it would change the way we think about medicine. This bacteria can also clearly exclude or inhibit pathogens in the astronauts. Will Pain Relievers Chemical Structure Be Effected After Being In Microgravity? Ibuprofen and Acetaminophen are used in a variety of situations involving pain, but will the medicine’s chemical structure stay the same if exposed in a microgravitational environment? If so, how will it change and how will the microgravity affect the medicines? The question we ask was inspired through the idea of Ibuprofen’s and Acetaminophen’s popularity around the world from helping with lowering the throbbing pains that come with headaches, to preventing heart attacks, through thinning the blood of the patient. For an example of why this experiment is relevant: what if one of the crew members of the International Space Station were to obtain a blood clot that is life threatening? Ibuprofen would be a resolution for that instance. How would those crew members know if the Ibuprofen still accommodated the same ingredient inside the chemical structure that produced the blood thinning effect? Acetaminophen is also a pain reliever, but has no effect on inflammation. According to everydayhealth.com, Ibuprofen is a pain reliever that relieves pain and fever, that also reduces inflammation. If we know the results of taking Ibuprofen and Acetaminophen on Earth, then the results of this experiment will affect how people use, and the way of how we view microgravity affecting modern day pain relieving medication. 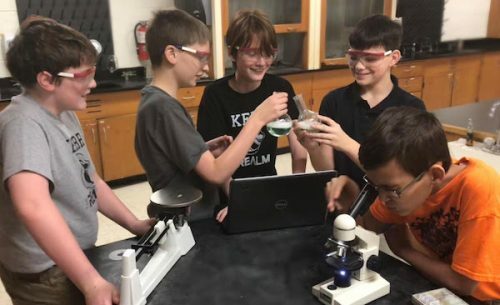 Ethan Moore, Ian Ray, Kenneth Sanders, Ryder Huskins, and Gabe McCarthy, from Burleson Independent School District, discuss findings from their mold growth experimentation while fine-tuning their experiment for Flight Safety Review. Our team will answer the question how Penicillium mold grows in a microgravity environment versus Earth’s gravity. This question answers or sparks several other questions such as is it a viable solution for some antibiotics in space or how do antibiotics like penicillin work in the body in space. Will it grow more or will it be the same or maybe grow less? The purpose of our experiment is to provide a viable solution to some bacterial infections in space. Bacteria in space tends to act more violently so maybe good bacteria or mold will act more furiously to kill those bacteria. Our hypothesis is that it will grow better. This is based off of the fact that in an earlier SSEP experiment the polymers absorbed more water. Which might be the same for organisms like mold so it would make it easier to absorb water. Plus with lower gravity organisms tend to grow larger at least that is many scientist hypotheses. So since there is practically no major gravity or forces in space may be the mold will grow larger than usual. Our group believes this based on the fact that we have researched. Our experiment is about diabetes Humalog synthetic insulin crystallization in a microgravity environment. We feel like this is a good experiment to design because we could find out if there is a way to prevent crystallization of insulin, especially if we understand how it happens in microgravity. When insulin crystallizes, the bacteria that usually makes it viable stops working. This would cause it to be ineffective for patients in dire need of this medication. To complete this experiment we are going to keep the insulin in a type 1 FME at the International space station (ISS) at above 65 degrees to see if it crystallizes within a certain amount time. We will keep the experiment refrigerated at or below 40 degrees during transportation to the ISS and again on arrival back to Earth’s gravity. Refrigeration slows the crystallization growth and this is how it is stored on Earth. Keeping our experiment refrigerated during transportation is an important step because the insulin crystallization growth should only be measured while in microgravity. We will be conducting the same experiment, using the same time frame and refrigeration needs before and after, for our earth bound experiment. Our experiment is how well will a hornwort plant purify polluted water in microgravity. We will see how it will purify at the same rate as it does in full gravity. We chose this plant because they can purify water and they grow at a fast rate. This will help astronauts because if they run out of water they can grow hornwort even if the only water they have is polluted. Also, it will help them to have purified water if their water system breaks down. The hornwort plant will be growing on the way from Earth to the ISS. The experiment will be purifying the polluted water in microgravity for 5-6 days. Then the formalin will be added to the plant to stop its growth and preserve the sample. We are polluting the water with Cyanobacteria, which is more commonly known as blue green algae. We will know it has worked if the polluted water has become purified after it has been tested. Students at Falcon Early College High School work on finalizing their experiment proposal, “The Efficacy of Ideonella Sakaiensis in a Microgravity Environment”. Plastic, specifically Poly(ethylene terephthalate) is commonly used for its convenience here on Earth. In fact, it is used so widely that it is becoming a major burden on our environment. PET can be found in many products that are non-biodegradable which means it can spend a significant amount of years in our environment. A recently discovered bacterium, Ideonella Sakaiensis has been proven capable of essentially of metabolizing PET. We are seeking to compare the efficacy of the bacterium Ideonella Sakaiensis in a microgravity environment to that on Earth. In our experiment, we plan on putting a culture of Ideonella Sakaiensis and Poly(ethylene terephthalate) in the same vial and waiting to see if the bacteria can decompose the material in the same way it would on Earth. We believe this will help us gain a greater understanding of how to dispose of plastics such as PET while in space as well as on Earth. Mushrooms are replenishable to the environment. The ability to take radiation that is harmful to humans and other Plantae. 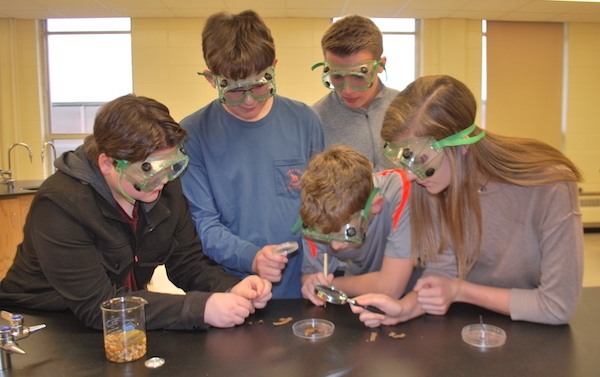 We, as in Falcon ECHS, want to send mushrooms to space to see how they adapt to microgravity. We will conduct the exact same experiment here on earth. Decomposers recycle nitrogen back into the environment. In order to colonize a new planet, decomposers will be essential to support life. Our first step is to see how mushrooms decompose in microgravity. The mushroom and soil will be in one side of the tube. Infused with dampened leaves, so the plant can live until in space. Separated by a clamp water with an orange peel which it will decompose. The clamp will be removed in space and the soil and mushroom will then glide to the water and diced orange peel. In this experiment, we will be providing a close amount of ten worker ants and a queen ant that will be sent into space in a type 1 fluid mixing enclosure mini- lab for the SSEP Mission 12 to the International Space Station to experience microgravity. The purpose of this experiment is to examine all the effects microgravity could possibly have on the ants and whether or not they would be capable of colonizing. Factors such as their ability to repopulate, their reaction to radiation, and microgravity in the ISS, and their overall development while in microgravity will be evaluated in our proposed experiment. We will be able to determine if the ants have attempted to colonize by observing a rise in their population once they are handed back to us. This will also show us if they’re able to repopulate in microgravity. While the ants are in storage and in microgravity, we’ll nourish them by providing a decent amount of honeydew for food and two cotton balls at each end of the tube that will be soaked beforehand in faucet water for a water source. This amount of food should be enough to last them throughout the four to six weeks that the ants will be in storage and on the ISS while exposed to microgravity. The crew will not have to have any interactions with the type 1 fluids mixing enclosure that we’ll be using. The only thing that will be asked is to handle the package with care. 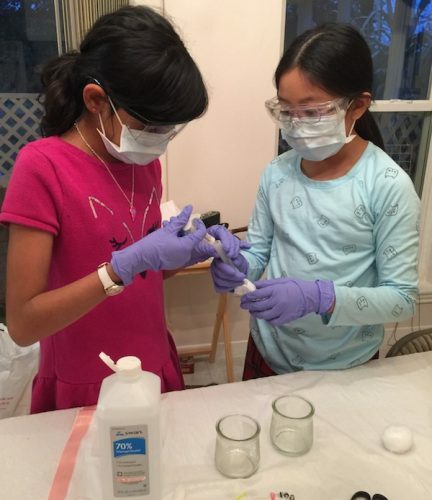 Zainab Basit and Isabelle Chang, 5th grade students from Setters Way Elementary, are shown working on a trial version of their project, “Growing Solanum Tuberosum in microgravity”, which will be carried out by astronauts aboard the ISS to test the effects of microgravity. Our query is will Solanum tuberosum (potato) seeds germinate in microgravity. If our project succeeds, we would like to make it so the process will be sustainable and edible. Our hypothesis is that the Solanum tuberosum seeds will germinate in microgravity because NASA has tried different plants like Zinnia and lettuce and they were successful. We think that potato seeds will be best to test because it’s high in plenty of different vitamins, and would be good for the astronaut’s nutrition and health. Potatoes are a great source of vitamin B6, potassium, copper, vitamin C, manganese, phosphorus, niacin, dietary fiber, and pantothenic acid. Potatoes also contain a variety of phytonutrients that have antioxidant activity which helps to fight off cell damage in the body. We are using a Type 3 FME that contains peat mix and Solanum tuberosum seeds in volume 1, water in volume 2, and 70% isopropyl alcohol in volume 3. Overall, we will be testing if Solanum tuberosum seeds can germinate in microgravity and if germinating works, we would like to test if the process could be sustainable. Sustainability is when a process is able to keep continuing and not run out of resources. Sustainability is very important in space, because resources are rather limited. 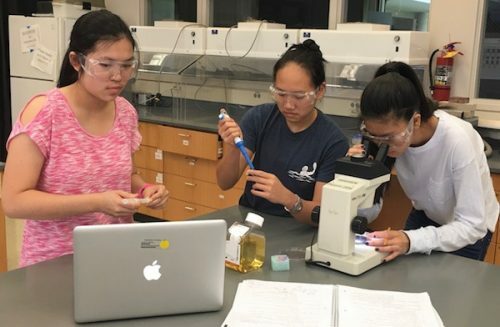 Christina Phong and Leena Joshi are conducting a test experiment while Athulya Nair and Michelle Zhou guide the team. The question is, “How Does Microgravity Effect Apium graveolens’ (celery) Germination?” In microgravity, the ability of most astronauts’ to produce saliva is at a slower rate compared to the astronaut’s’ ability to produce saliva on earth. Saliva is used to prevent biofilm from piling up on teeth. By taking in celery, not only will the astronauts’ salivary glands start producing more saliva, but celery will also get rid of their bad breath, which is caused from having a dry mouth. Another benefit of celery is that it contains a high percentage of water, which prevents dehydration, and this fact relates back to how celery can stimulate the astronauts’ salivary glands to produce more saliva. The type of FME used for the experiment will be FME type 3. The researchers will first ask the astronauts to unclamp clamp A to add the water to the soil and seeds. Then, after two weeks under the influence of microgravity, the fixative (formalin) will be added to the seeds to stop the growth of the plant. This is to get accurate results for the analysis that will take place once the experiment has returned to Earth. The experiment will be measured based on the difference in growth of Apium graveolens in microgravity, compared to the growth of Apium graveolens in earth’s gravity. The growth will be measured in centimeters. 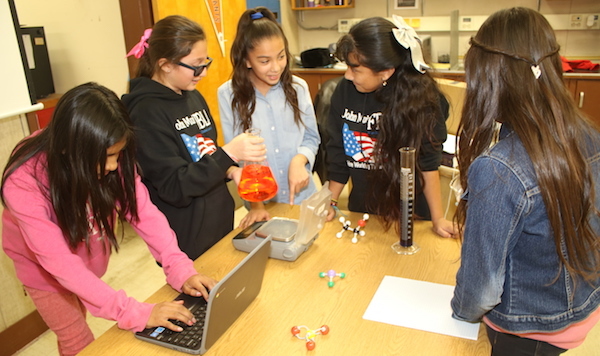 How will microgravity affect how sugar, yeast, and water mix to produce carbon dioxide? We know that yeast is a cool organ. It is like a plant cell, but is not is a fungi. We think that sugar, yeast, and water will produce carbon dioxide will mix in space. If our project produces carbon dioxide, we can use it to grow plants in space. One of our big concerns is that when the sugar, water, and yeast mix in space the sugar, yeast, and the water may separate and will not mix. Microgravity can affect that. We really hope they react the same way as is on Earth. Can L. acidophilus Prevent C. albicans in the Presence of Microgravity? In space, an astronauts’ ability to fight diseases, or their immunity, somewhat diminishes. Several pathogens, or “bugs,” are also harder to kill in space; this includes some bacteria and fungi, thus putting our astronauts at higher risk of diseases. A common pathogen is Candida albicans, which can cause yeast infections. C. albicans is proving difficult to kill in space, as the Candida tends to switch into forms that make them harder for antifungals to kill. Some are also becoming difficult to kill on Earth. A natural defense against Candida is acidophilus, which is found in yogurt. Acidophilus is actually naturally found inside our gut, but one can find it in concentrated amounts in yogurt and in pill form. Prior SSEP experiments have observed the growth of acidophilus in space, but never have they observed the effect it has on candida; so it is desired to observe acidophilus’ ability to prevent candida’s growth in microgravity. It will benefit the astronauts by preventing yeast infections while they are at higher risk of infection in space. Tardigrades (Milnesium tardigrada) are one of the most resilient creatures on Earth. They can survive anything from potent alcohol to vats of freezing liquid helium. But how? When tardigrades are in an area with unfavorable conditions (e.g. lack of water, freezing temperatures, increased solute concentrations, lack of oxygen, etc.) they undergo cryptobiosis: a process that slows (or sometimes even halts) their metabolisms. This, in turn, helps the tardigrades reduce resource consumption. The reduction of resource consumption allows the tardigrades to sustain themselves. The proposed experiment, inspired by this naturally occurring cryptobiotic phenomenon, tests how microgravity affects the metabolic rates of tardigrades deprived of oxygen (by means of a coordinated helium release). Using the results of this experiment, scientists could theoretically create a synthetic long-term form of cryptobiosis (informally known as hypersleep) using anoxybiotic strategies. By utilizing this information, scientists could expand current horizons to not only help astronauts (by providing ease in deep-space exploration) but also the general public (by allowing resource conservation in medical crises). 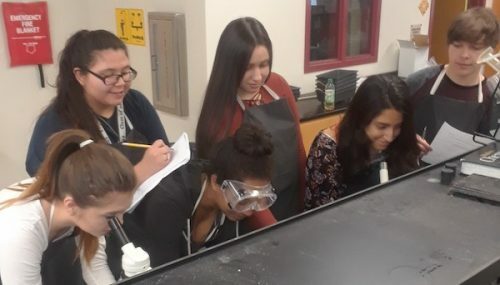 SSEP Selected Student Flight Team from PSJA Thomas Jefferson T-STEM Early College High School runs tests to analyze how microgravity will affect the development of hybrid brine shrimp. How will microgravity affect the development of hybrid brine shrimp? Our experiment will hatch multiple hybrid brine shrimp on board the International Space Station as well as on Earth. We will use the Type 3 FME for our experiment. Our plan is to fill Volume 1 with 4 mL of distilled water with the Water Purified Packet (salt, soda, water conditioner). This will also create a saline (salt) environment that will allow the brine shrimp to develop. Next, we will add .2 mL of Instant Life Eggs (5 sea monkey eggs) and .005 ml of Growth Food (yeast and spirluna) to Volume 2. Volume 3 will contain 2 mL of formalin. Upon arrival of the ISS, astronauts will release Clamp A at A=0, which will allow the purified water to get eggs, yeast, borax, soda, salt, and spirulina to the brine shrimp. At U-2 we will release the formalin in Clamp B to kill the synthetic brine shrimp. When the ISS-bound experiment is returned to Earth, we will compare the data that the astronauts collected with the data we collected on Earth. Data will include their reproduction, asexually and sexually; their size; how they adapt to microgravity; and overall development of their appendages. We hypothesize that the development of the hybrid brine shrimp will be abnormal and that their size will be small. 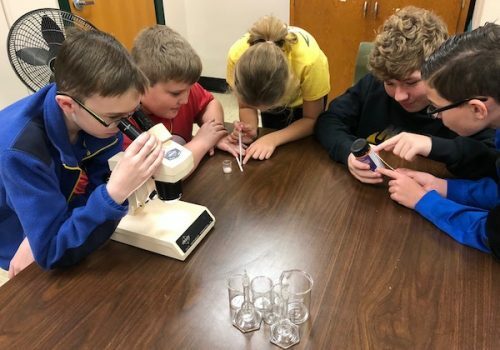 Learning about brine shrimp development can help scientists better understand how aquatic life develops in an environment with microgravity. Does Microgravity Affect the Rate of Binary Fission in Paramecium Caudatum? Our proposed question of experimentation is does microgravity affect the rate of binary fission in paramecium caudatum? We decided to research binary fission to observe if microgravity affects in any manner the way or the rate at which the genetic material replicates. Paramecium caudatum is often the subject of wide research fields due to the ease of growth. We have decided to use paramecium caudatum because of the fact that this special heterotroph lives in aquatic habitats, replicates by the process of binary fission, and could help with the eradication of harmful fungi and algae. What is the Effect of Microgravity on the Rate of Reproduction by the Number of Sea Monkeys? How will microgravity affect the growth of developing sea monkeys? Our experiment will demonstrate the development of sea monkeys in microgravity on board the International Space Station (ISS) and on Earth. In addition, we will be using Type 3 FME for our experiment. We will fill volume 1 with 2.8 ml of distilled water, on volume 2 we will put a small amount of sea monkey eggs and a teaspoon of powdered yeast for them to eat, and on volume 3 we will put formalin at 37% strength to kill the sea monkeys after the experiment. Once on the ISS the astronauts will release clamp A for the microgravity experiment letting volumes 1 and 2 to mix for the experiment to start. For the period the sea monkeys are there the astronauts will examine if there have been any deformations on the sea monkeys while they were developing. We will observe if there have been any changes on the sea monkeys like any deformations. We hypothesize that there will be some deformations because we think that cells will possibly mutate do to the effects of microgravity having the cells to struggle causing deformations. 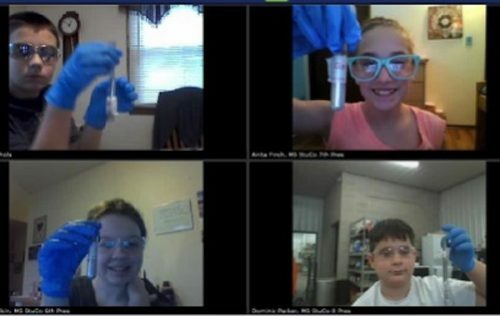 Andrew Nichols (top left), Anita Finch (top right), Grace Mullikin (bottom left), and Dominic Parker (bottom right), performing their SSEP trial experiment in their own homes across the state of Wisconsin with iForward Online Public Charter School. Our experiment seeks to determine if there will be a change in the grain size and distribution of processed gallium metal in a microgravity environment. The specific processing to which we are referring involves changing the state of gallium, wherein it is melted, then allowed to refreeze in microgravity. The prospect of gallium’s applications in space technologies either alone or as an alloy can only be determined by learning about gallium’s most fundamental properties. We will compare the grain size and distribution of grains of the Earth-based sample to the SSEP sample by using optical microscopy and the “Chart Comparison” method. Electron microscopy will reveal evidence of potentially other materials present in the samples. Based on analysis of the results of processing the SSEP sample, we will be able to draw some conclusions as to how the grain structure has been altered and the implications for unique mechanical properties. Unique mechanical properties open the door to uses for gallium not currently considered. The possibilities are endless whether for vehicle design, permanent structures, containment vessels, electronics, or other applications yet to be invented. Our experiment seeks to determine how the density, porosity and strength of Portland cement is affected when the cement is set in microgravity. Because additional analysis cannot be performed on the ISS, we will measure the density, porosity and flexural strength of the SSEP sample after it returns to Earth. We will compare the density, porosity and strength of the sample used on the ISS to a similar cement sample that was prepared on Earth. Knowing how microgravity affects the setting of cement, and therefore knowing its mechanical and physical properties, can have important significance regarding colonization efforts. We need to know these properties of cement to determine how feasible it would be to use cement, or a cement-like material, for construction, in microgravity. Yeast has been used for thousands of years in food production and for decades as scientific model organism. We would like to test the fermentation of yeast (Saccharomyces cerevisiae) in microgravity conditions. Gravity may be an important component of cellular processes, and it is unclear if yeast will be able to ferment normally in microgravity. We will analyze the biochemical products and genetic expression of yeast to determine how this normal cellular process is affected by microgravity conditions. The growth and function of yeast may provide insights into the function of other cellular processes in microgravity, or may determine the potential usefulness of yeast as a food source in space. In addition, many yeasts can be pathogenic, which is important to consider for the health of humans in space.